I think this is the fourth attempt I have made at writing this post! To be honest it’s usually a time of struggle or challenge that keeps me away from my little corner of the world wide web, but I’m happy to report that this time it’s down to being busy…to, dare I say it, embracing the very privileged moment in time we are experiencing. When Richard first floated the idea of this ‘sabbatical’ for want of a better word, I was quick to point out all the reasons why we shouldn’t do it – those of you who know me very well won’t be surprised by that at all. Change and I are somewhat uncomfortable bedfellows. We have now been in Bend for just over six weeks and things are going well. 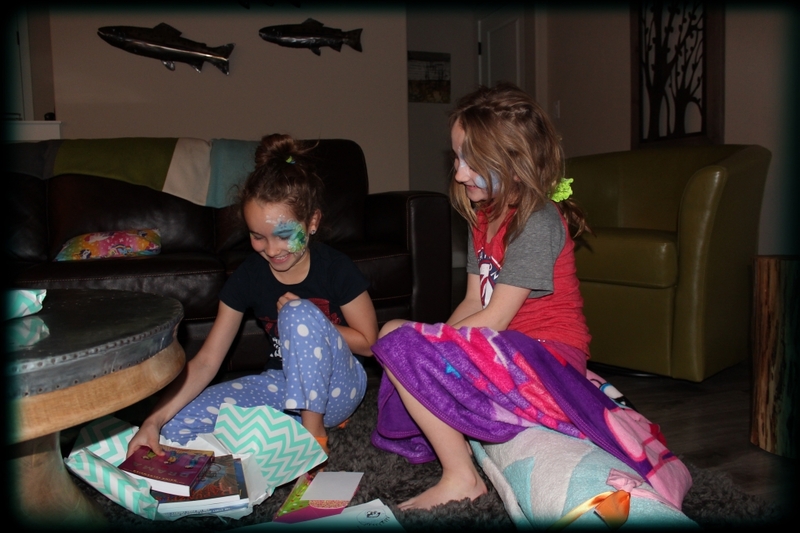 Of course like anything, it’s not all wine and roses – I have on more than one occasion threatened to march Olive and Edie down to the local school for the last few weeks of the academic year – but all things considered, life in Bend is suiting us pretty well. Before we made it to Bend, we did partake in a bit of a road trip, which is what this post was meant to be about when I made my first attempt to write it a month ago! Richard made the entire drive from east to west, whilst the girls and I did a wee bit less than that. When school broke for spring break we flew to Denver and met up with Richard and the tardis, aka our car, which was crammed full with all manner of necessary items…coffee machine, five bikes (! 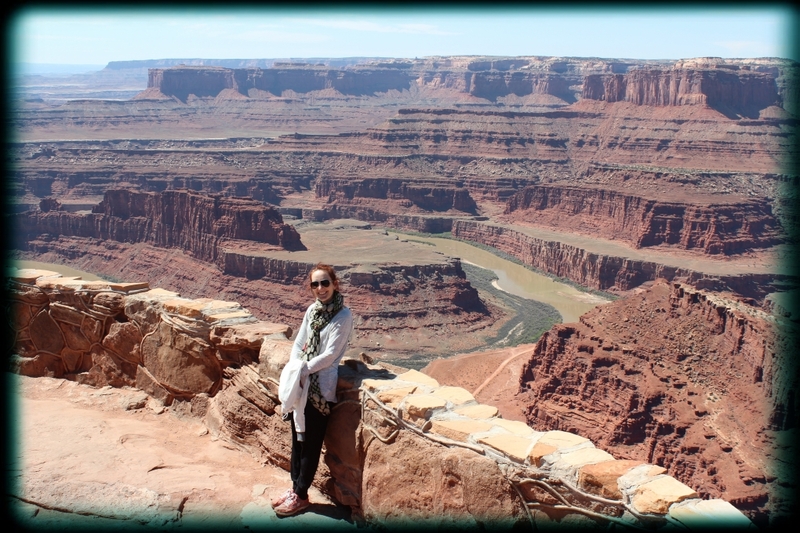 ), scarves and sunglasses to reenact iconic moment from Thelma and Louise…you get the picture. 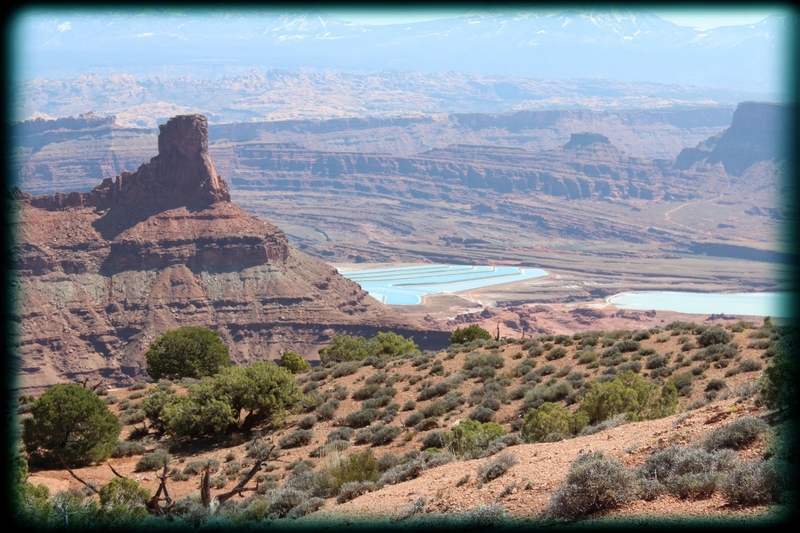 We drove straight out of Denver and headed for Moab in Utah, an amazing drive which took us into landscapes that looked completely other worldly. 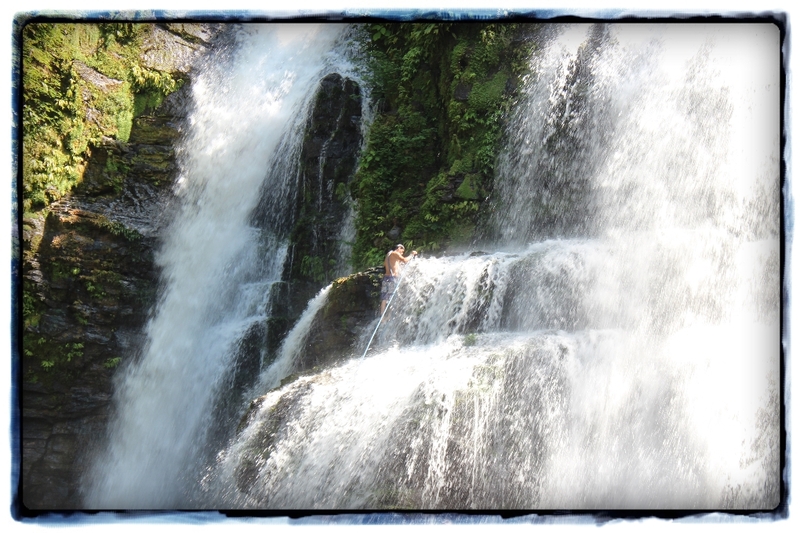 So many cries of “wow, look” as we journeyed further west. 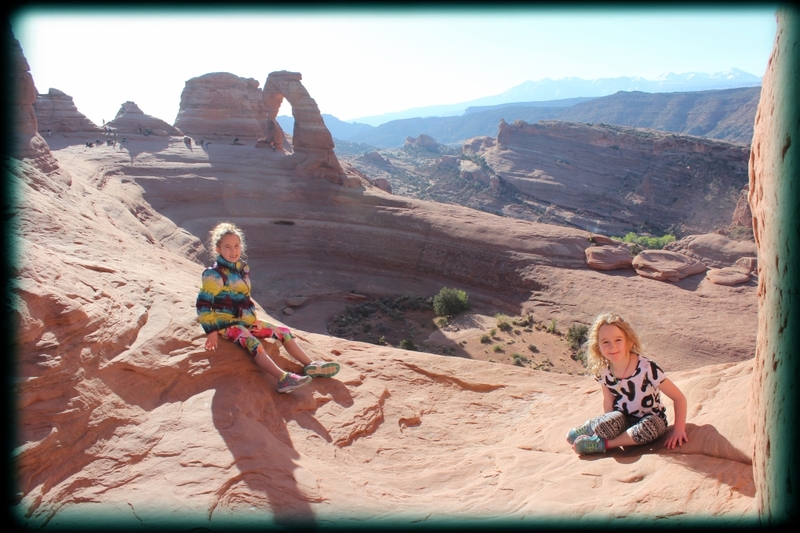 Our goal in Moab was to go hiking in Arches National Park, home to over 2,000 natural stone arches, and a place that was settled over 10,000 years ago at the end of the Ice Age. 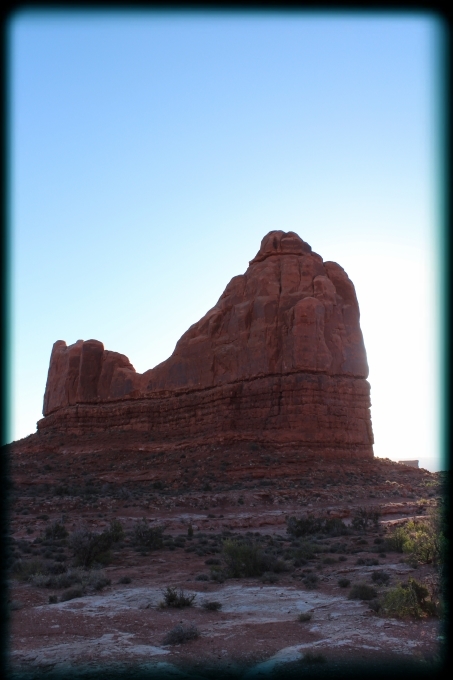 Heading into the park to walk to Delicate Arch, the unofficial symbol of Utah. 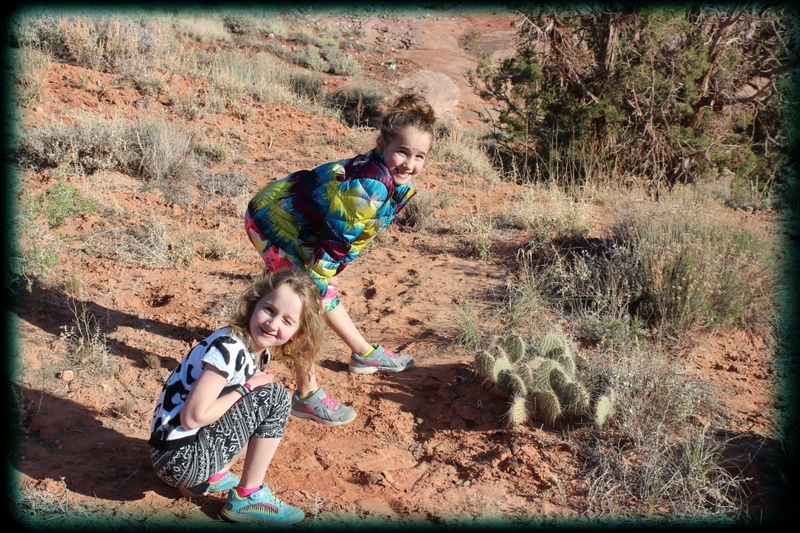 Olive and Edie were great hikers, full of interest in the amazing environment. 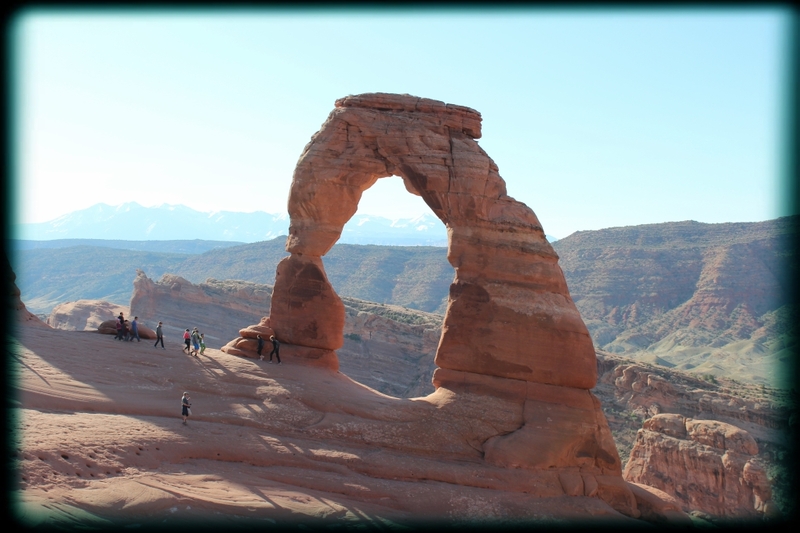 Delicate Arch in all her glory. The girls were a bit braver than I when it came to venturing out on the rocks. At times it felt like being on another planet. 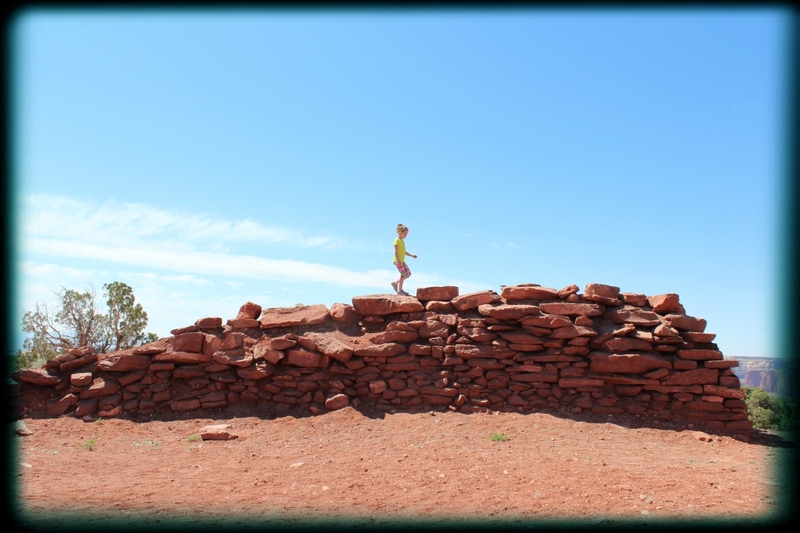 The girls took every available opportunity for climbing rocks. To be honest I was a bit underwhelmed by Park City…not a celebrity in sight! Still it wasn’t film festival time…I’m sure it’s quite the place then. Spot of snowboarding with True Blood’s Alcide…mmm…could have been persuaded to stick around Park City for that! Next up was Boise, Idaho, one of those places that I’d read about or heard mentioned on tv or in movies but never in a million years expected to actually be in. We were only there overnight but were quite taken by it…had a very cool cafe which is always the mark of a good town in our book. We rolled into Bend on a Monday afternoon and set up home in our little house on the west side. Unfortunately we woke up the next day to the news that Richard’s mother had passed away so our first official day in Bend was spent sorting flights, accommodation and rental cars and getting Richard off to the airport. 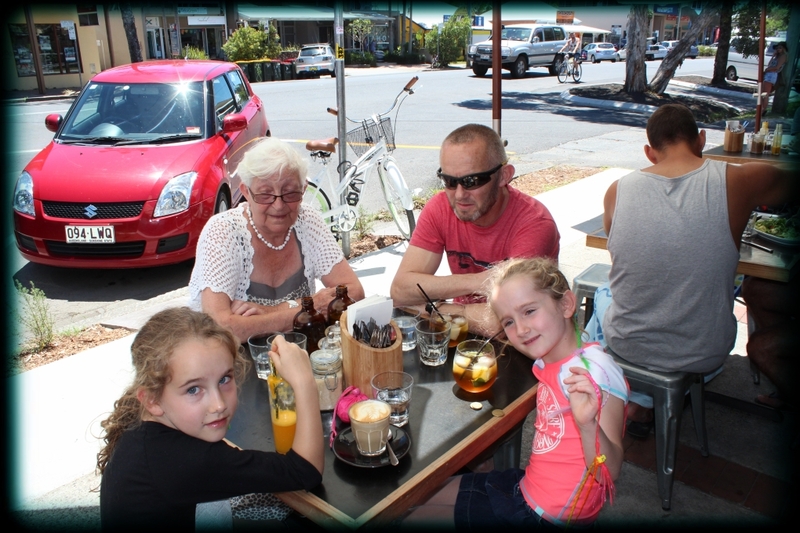 With Grandmama in Byron Bay, December 2013. The girls and I spent the week getting to know Bend, which required numerous trips to Trader Joe’s and Whole Foods – Winchester friends will understand the great excitement at having both these stores in town! The girls even did an art class for a couple of mornings which enabled me to focus on getting my big projects finished for the two courses I was doing. Richard made it home in time for the final few hours of Olive’s birthday and we were able to start getting into the swing of life in Bend. Owing to Richard having to head to Australia for a week and me having to get all my study complete, we didn’t properly start homeschooling until our third week in Bend. We are doing a very hybrid, make it up as you go along kind of approach! We are using the K12 online system for maths, spelling and history; blogging and corresponding with friends and family are our writing themes and, as Bend is located in an area of great volcanic significance, we are focussing on all things volcano related for science. Reading pretty much takes care of itself although I have insisted on a daily SSR time where only novels are allowed to be read – the graphic novel obsession continues unabated! 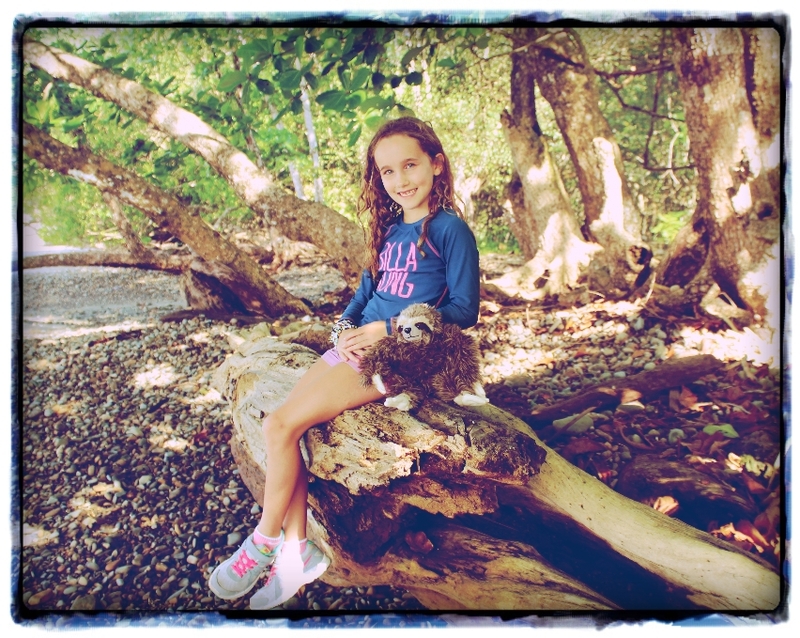 PE is the easiest subject to work on – we’ve hiked, mountain biked, explored playgrounds and the girls do gymnastics twice a week, and Olive is trying out a kid’s running club this week. (In Bend you can get picked up from school by bus and taken to mountain biking class! You can guess how tough Richard is finding it to live here 🙂 I too am very happy to have found a great yoga studio and am starting each day with a 6am class. I didn’t think it would be possible to find a studio that could match Shine in Winchester but so far I’m loving it.) Olive and Edie’s foray into blogging revealed a need for speedier fingers on the keyboard so they are also doing an online typing program. 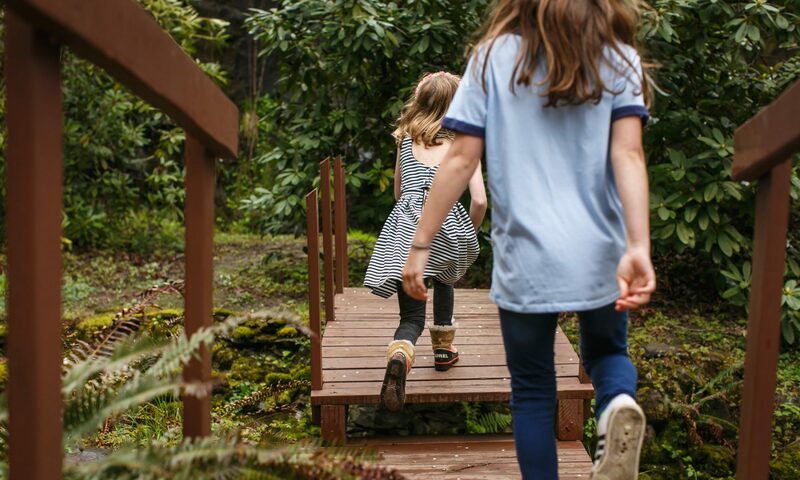 We usually spend the morning working – 8:30am till 12, which leaves us the afternoon free to get outside and explore Bend’s fantastic outdoors, make trips to the library or meet up with our friends online. 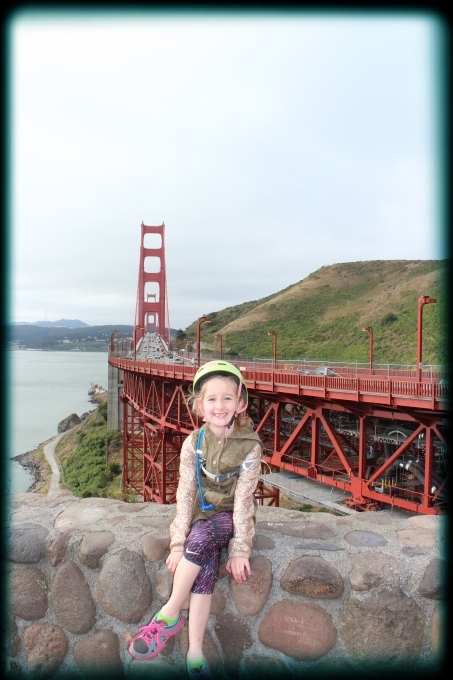 Or we bunk off school for a few days and head wherever Richard has to go for work – San Francisco anyone?! We like to call it education outside the classroom. I’d like to say a big thank you to wonderful friends and family who are supporting Olive and Edie’s letter writing. They get so excited when there is something just for them in the mailbox. Also thanks to those reading and commenting on their blogs. I suspect they are going to beat me to all the good stories! You can click here for Olive’s and here for Edie’s. 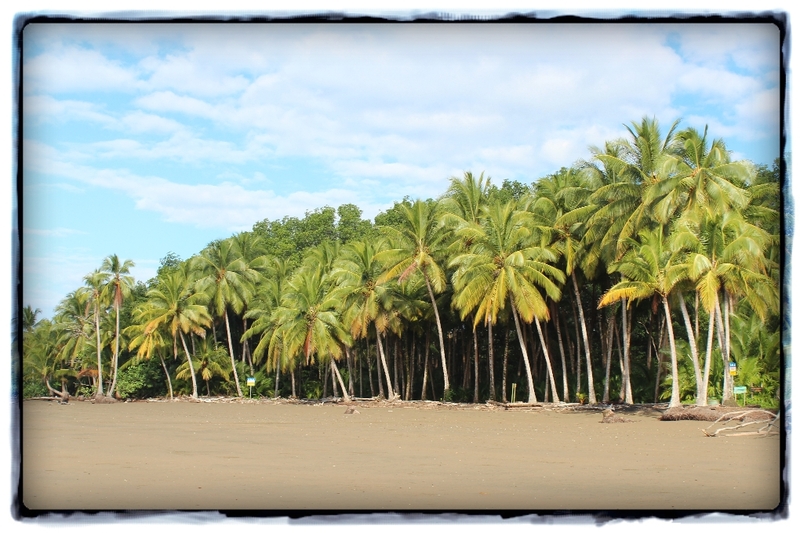 Christmas Day in Costa Rica turned out to be very quiet and relaxed. Unfortunately both Richard and Olive had upset stomachs. Olive had discovered the maracuya, a larger and slightly more sour type of passion fruit, and I suspect her tummy was telling her “enough with the maracuya!” Being the highbrow family that we are, we couldn’t get through the day without numerous references to maracuya and poohya…I always thought girls were meant to be immune to all that toilet humor!! Olive and Edie posing with one of the many and varied Nativity scenes we encountered during our trip. 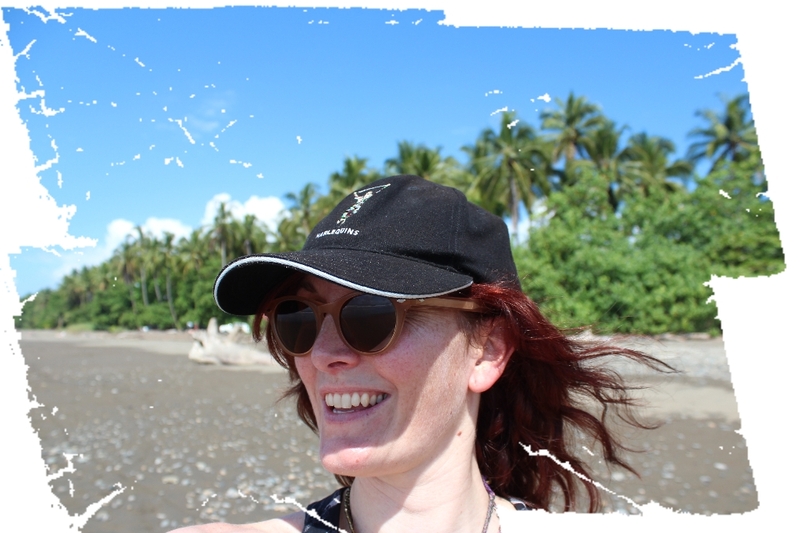 Despite the dodgy tummies we did manage to make it down to Dominicalito Beach for a couple of hours…just like a real Kiwi Christmas day. 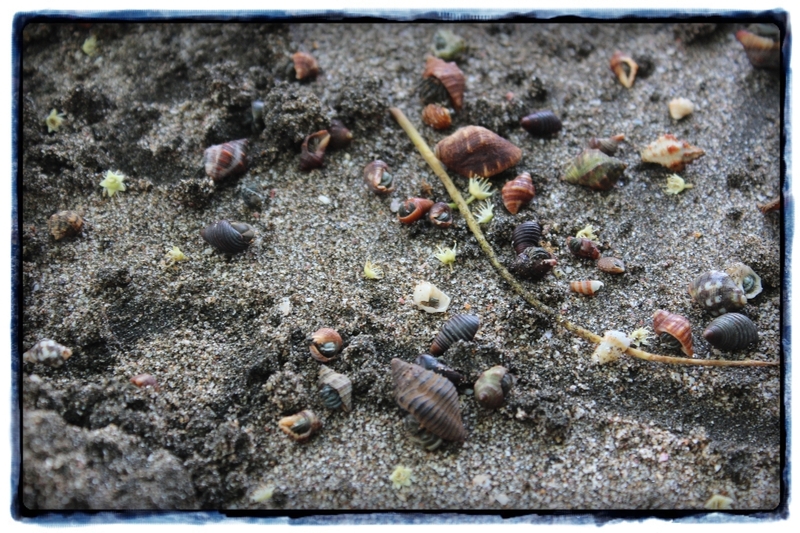 Watching the hundreds of hermit crabs on the go was fun. Olive and her sloth. 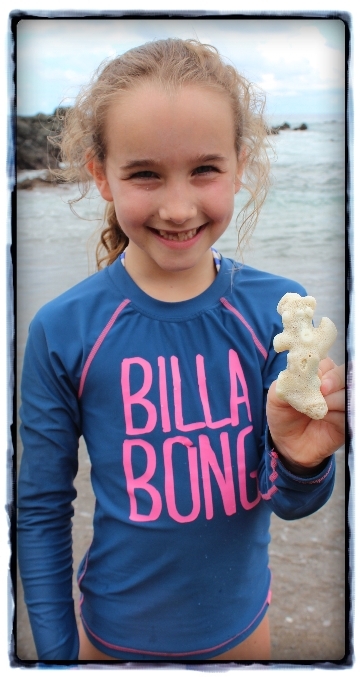 Our non stuffed animal lover instantly fell in love with this one…of course we forgot to pack it! 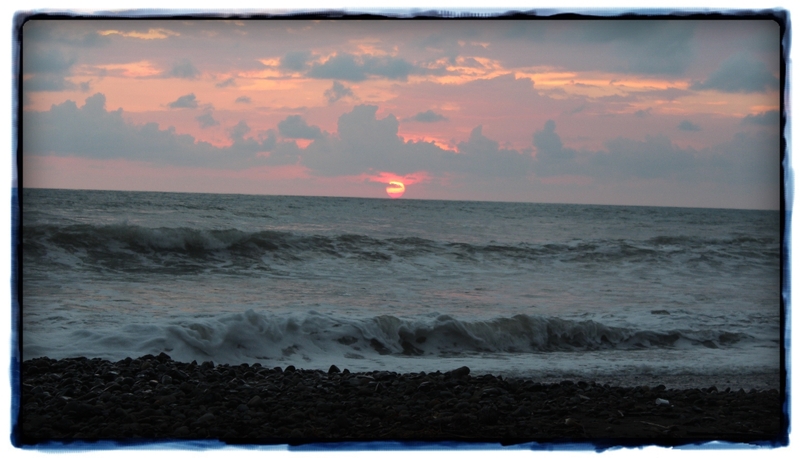 Watching the sun set at Dominical beach on Christmas night. Magic. 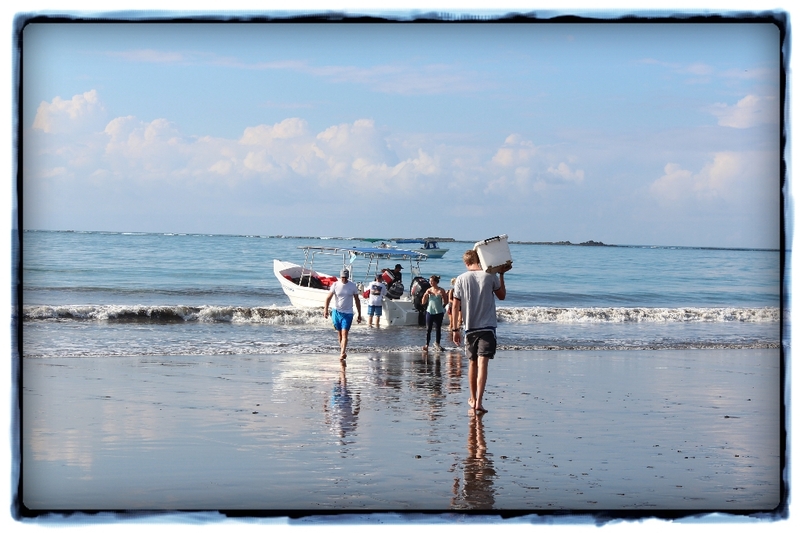 On Boxing Day we went back to Ballena National Park to take a walk on the whale’s tail. 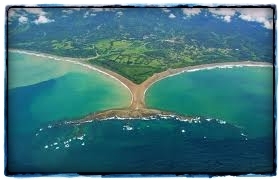 It literally has the shape of a whale’s tail and is a place where humpback whales come twice a year. You can only walk on the tail when the tide is out so you have to time it right or you could get stranded. The whale’s tail from above. Our more down to earth view. Once again Edie spent every possible moment in the water. 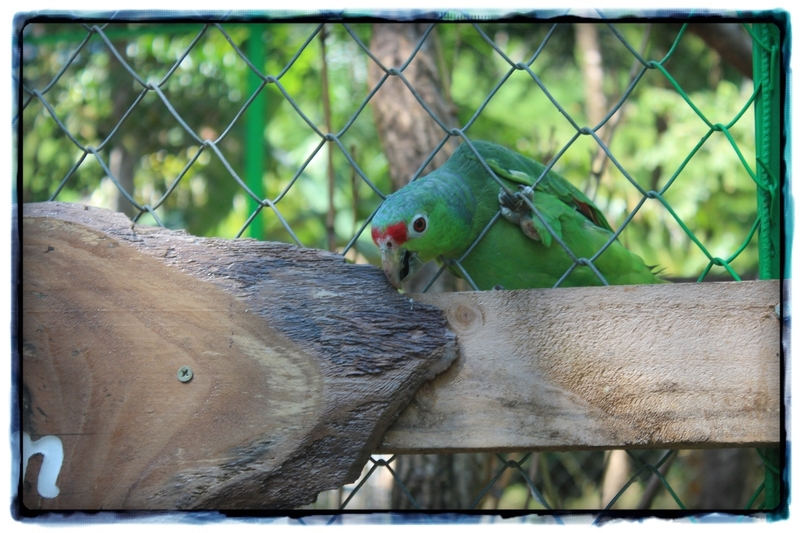 Our last adventure in Costa Rica was a trip to the Alturas Wildlife Sanctuary. 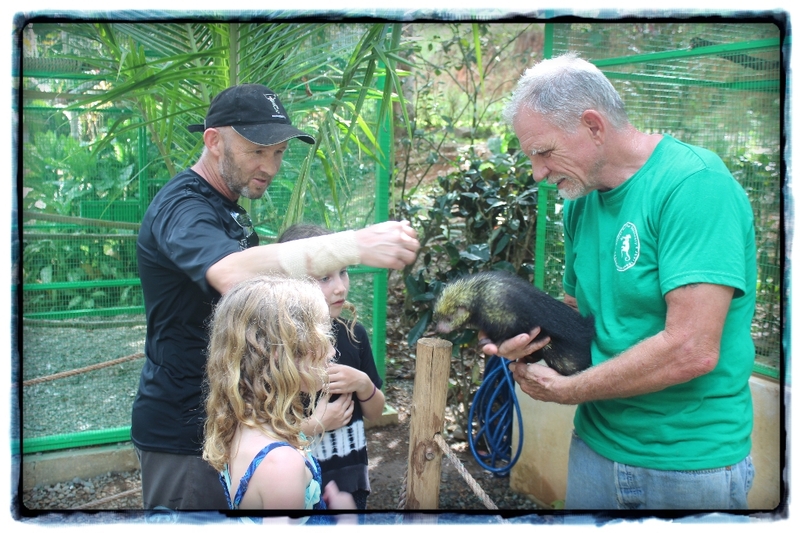 We got to meet all sorts of wildlife who had been rescued from various situations. 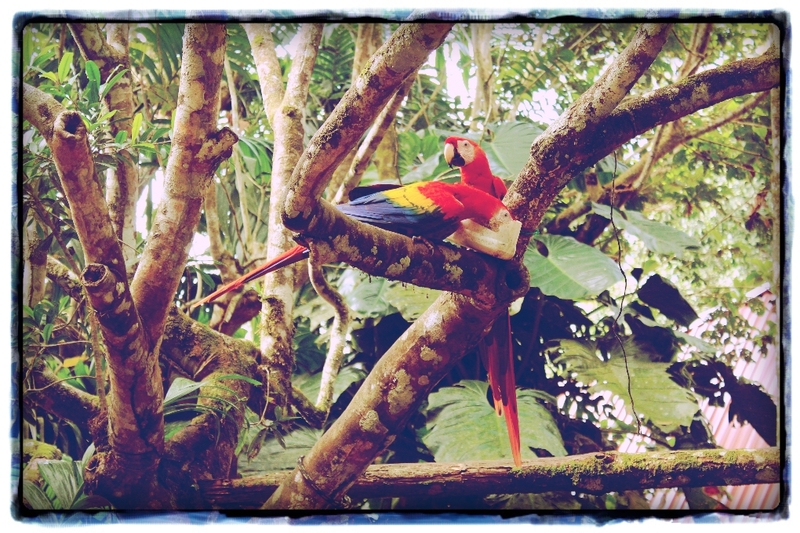 It’s illegal to keep Costa Rican wildlife as pets, but many people do. When the animal is discovered it often ends up at Alturas. 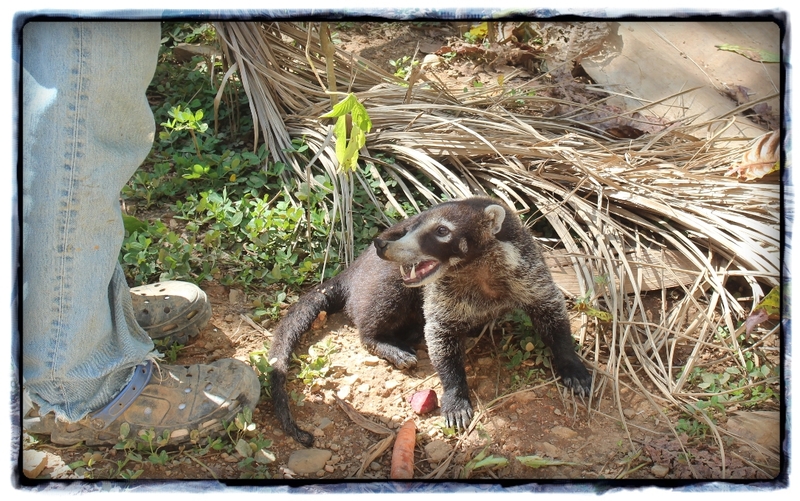 They also take in animals who have been injured or mistreated. 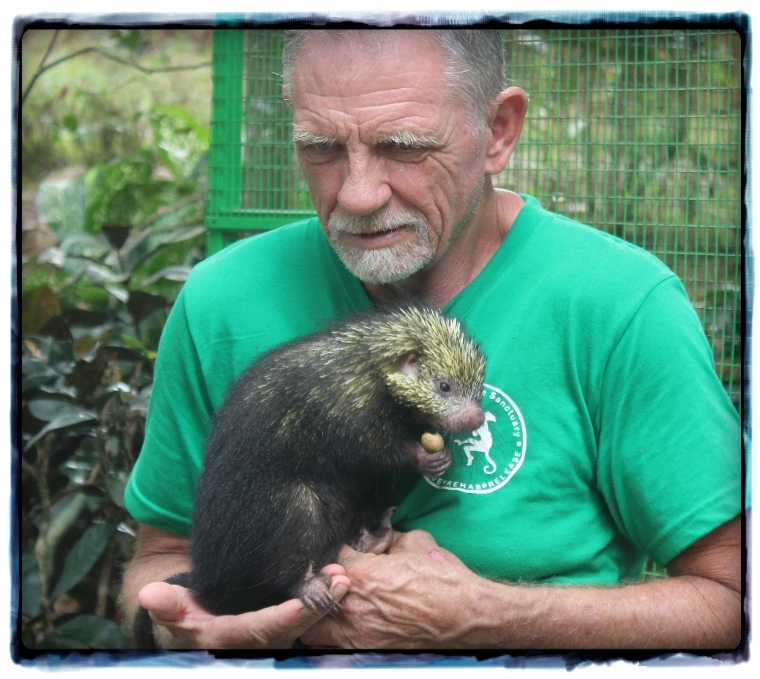 The goal is to rehabilitate the animals and, if possible, get them back into the wild. 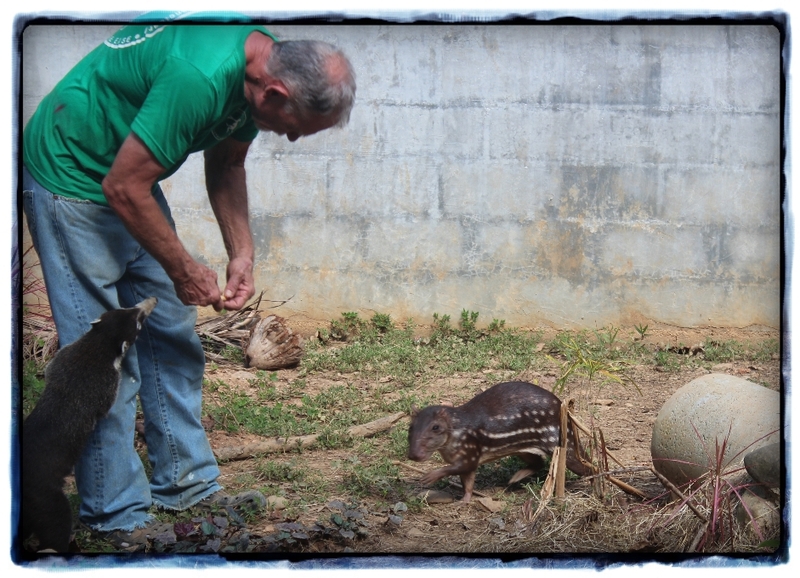 Once released, many of the animals keep very close to the sanctuary and have been known to pop back for a visit. I never thought I would describe a porcupine as cute but this wee girl was so adorable. 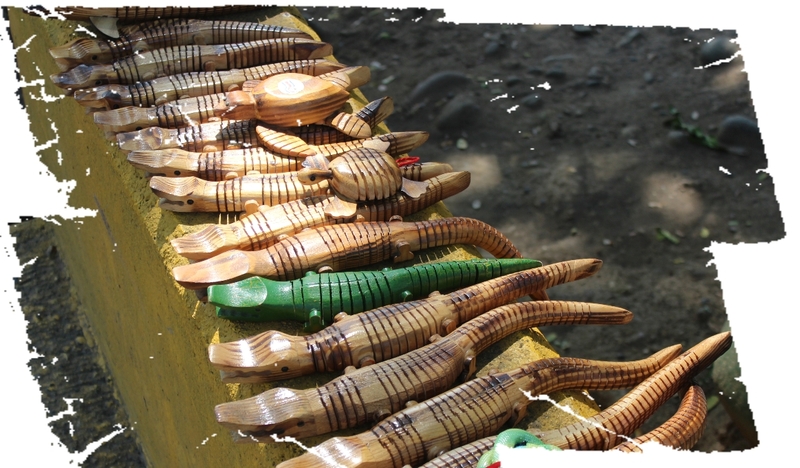 Apparently these wee critters taste amazing – ugh – but as a result are very endangered. 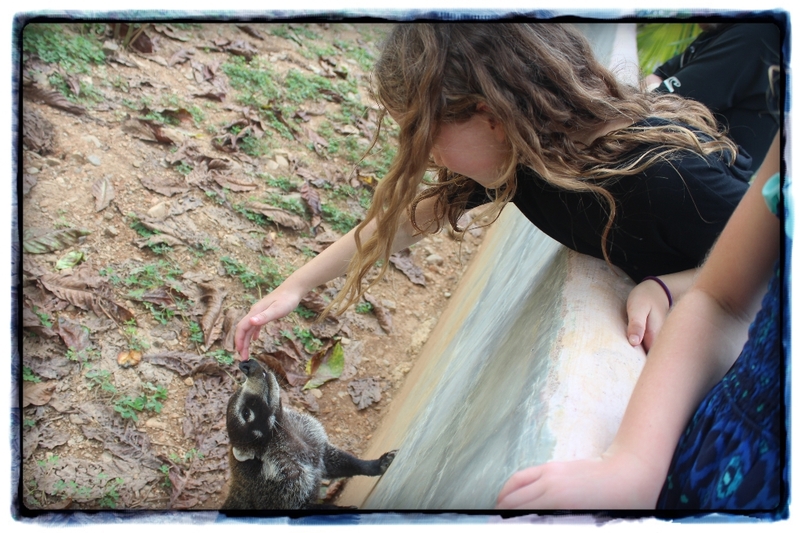 Olive and Edie loved getting up close and personal with all the animals. 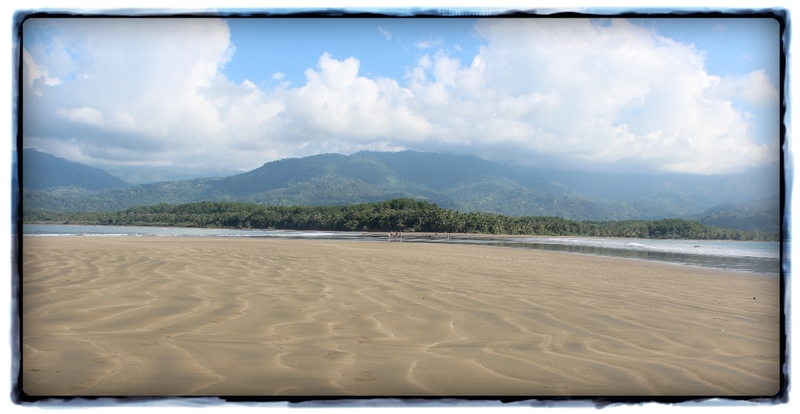 “Oh $#@*!”….breathe…Pura Vida, Pura Vida, Pura Vida! 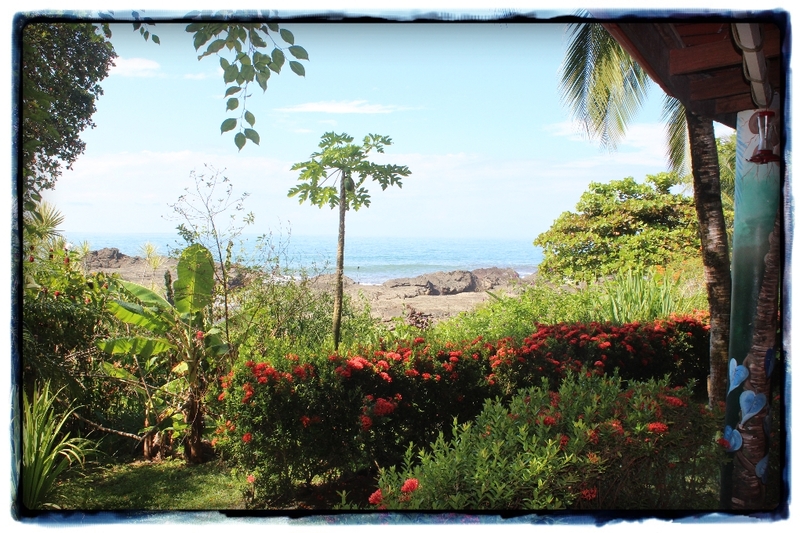 We spent a quiet Tuesday morning, breakfasting at a great cafe (so good we ended up eating there three times), taking in the beautiful views and watching a few locals get their downward dog on in a beachfront yoga class. 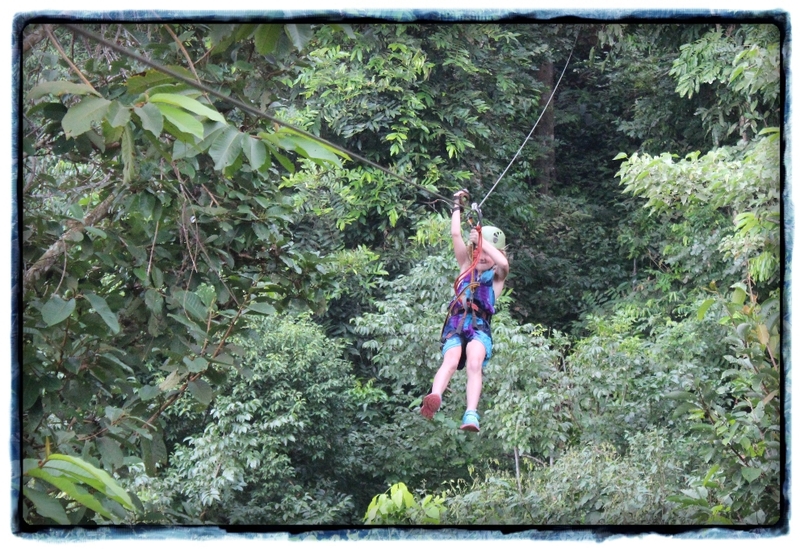 Our adventure for the day was a zip lining tour, high up in the hills near the Osa mountain village. 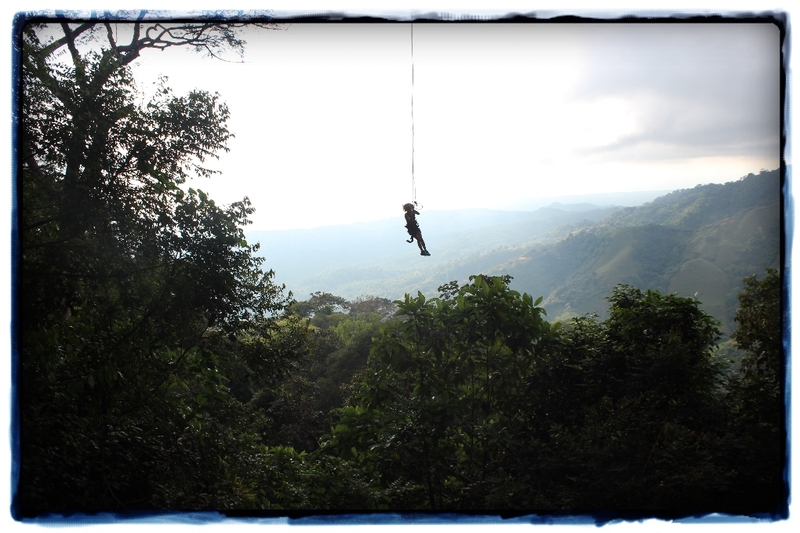 After a very bumpy and very steep ride on the back of a truck we arrived at the start of the course…a rather high zip line stretching off into the distance. 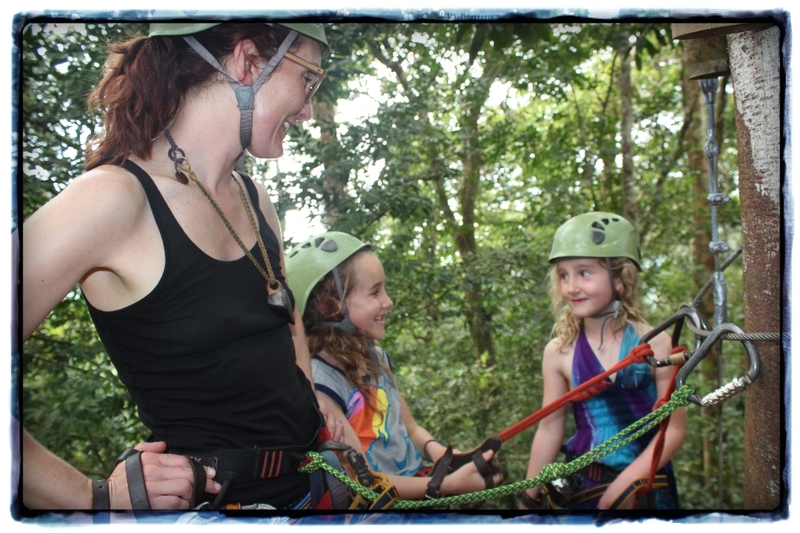 “We’ll take the kids for the first one and then they can do the rest themselves”, I was cheerily told by our instructors. Um…I don’t think so! and Edie was not far behind her. They even had to control a brake and slow themselves down before reaching the platform at the end of each line. Once again, very impressed with my girls! 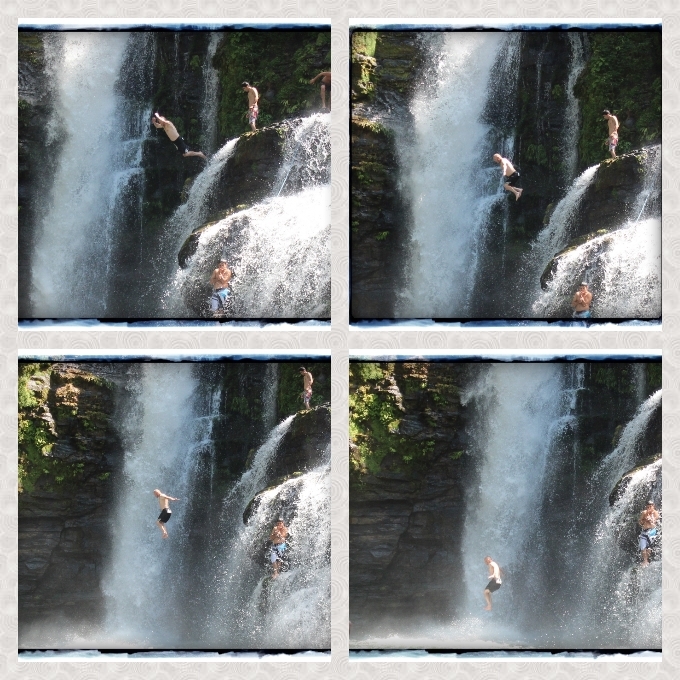 It was so much fun…even I loved it. Edie making her way down to the ground. 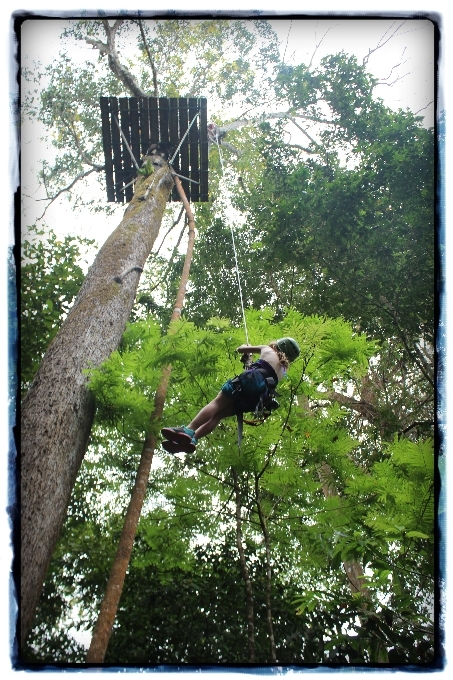 Enjoying the rope swing at the end of the course. 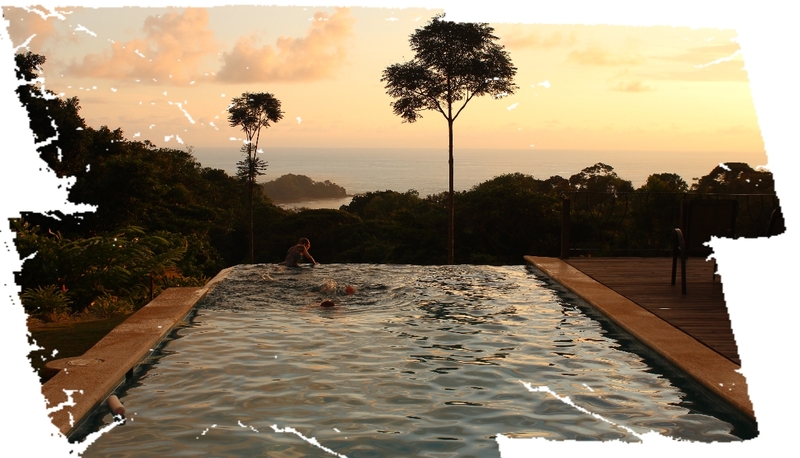 And just in case you thought our wonderful pool wasn’t getting any use…this is how every spare moment was spent. Edie would dash from the car, strip and jump straight in! 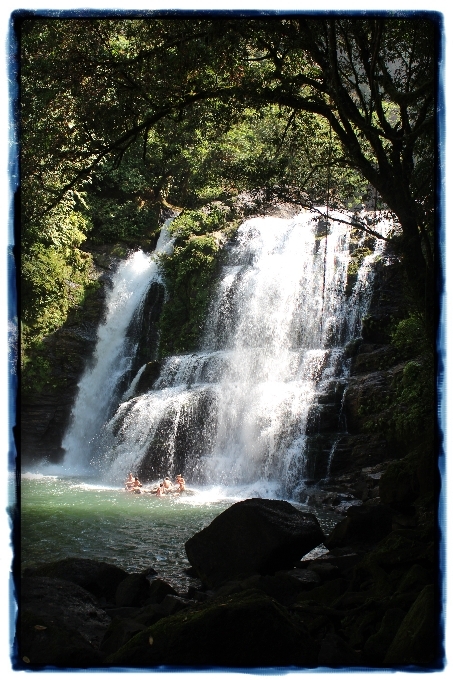 We spent Christmas Eve on a horse trek to the beautiful Nauyaca Waterfalls. I have to admit to being somewhat nervous as it had been a very long time since I’d been on the back of a horse and I wasn’t sure how the girls would get on. Once I’d reconciled myself to the fact that my horse had to be at the front of the pack, regardless of who she had to push out the way, or how fast she had to move to get there, I managed to relax and enjoy myself. Edie didn’t like it at all to begin with but after we’d had our first rest stop, she announced that everything was ok as she could now “communicate with horses”. 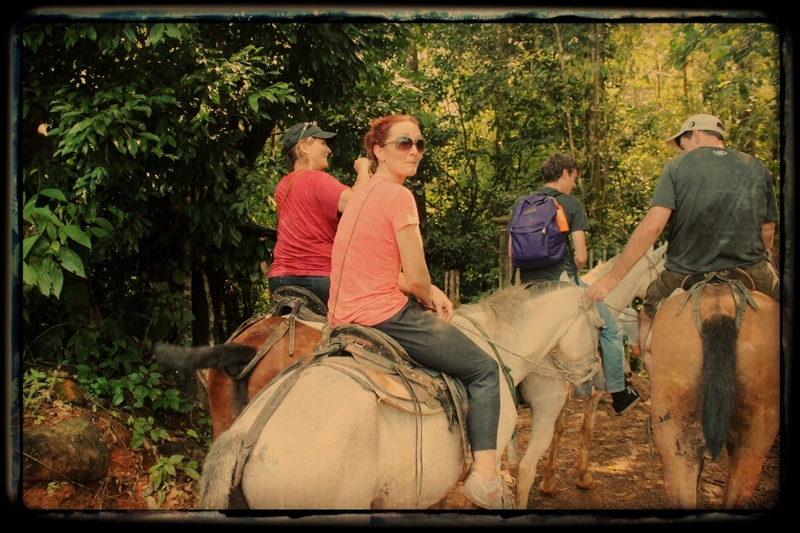 Whatever she said to herself or to the horse, clearly worked because she loved every minute of the rest of the trip. Olive took to it like a duck to water and Richard, mounted on the dubiously titled “Tequila”, declared it one of the more boring activities he’d taken part in! What the…? 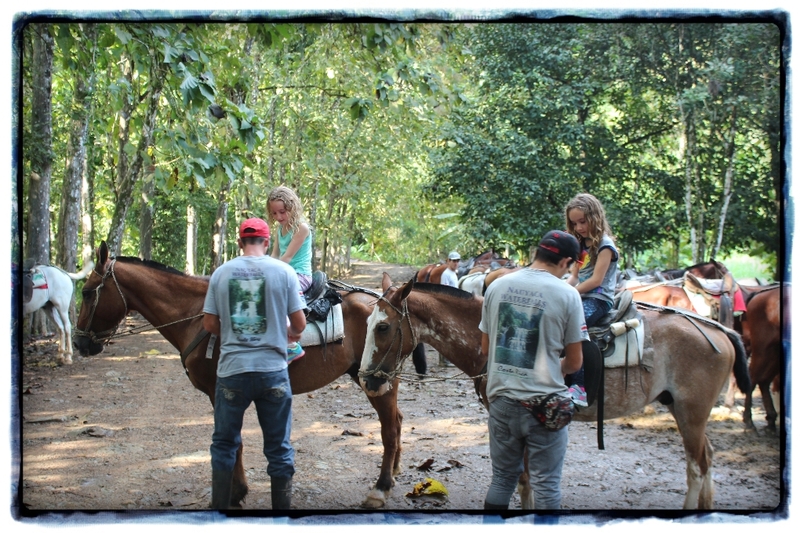 Saddled up and ready to hit the trail. 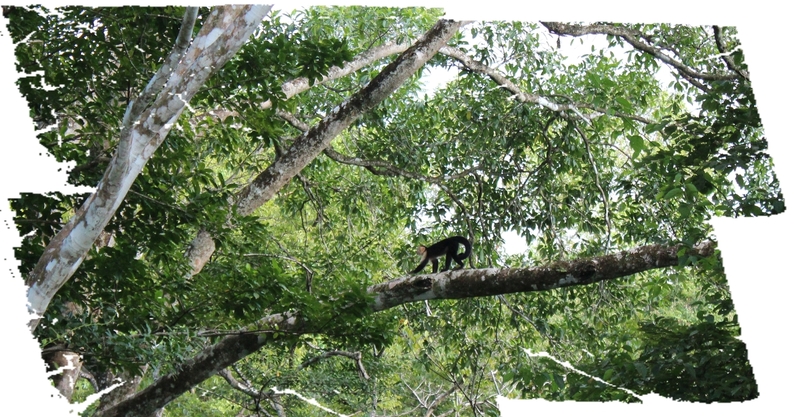 We made two stops for a traditional breakfast and lunch and were treated to some spectacular wildlife. Me and my Speedy Gonzales! Oooo…this would be good for a Christmas card…one year I’ll get around to sending some! hope his expensive teeth are still in there! 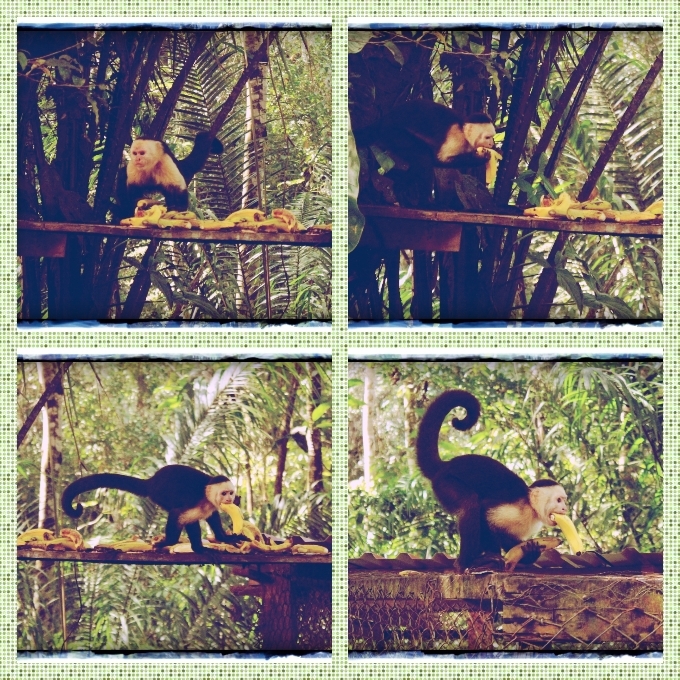 During the lunch break it was time for some entertainment monkey style. 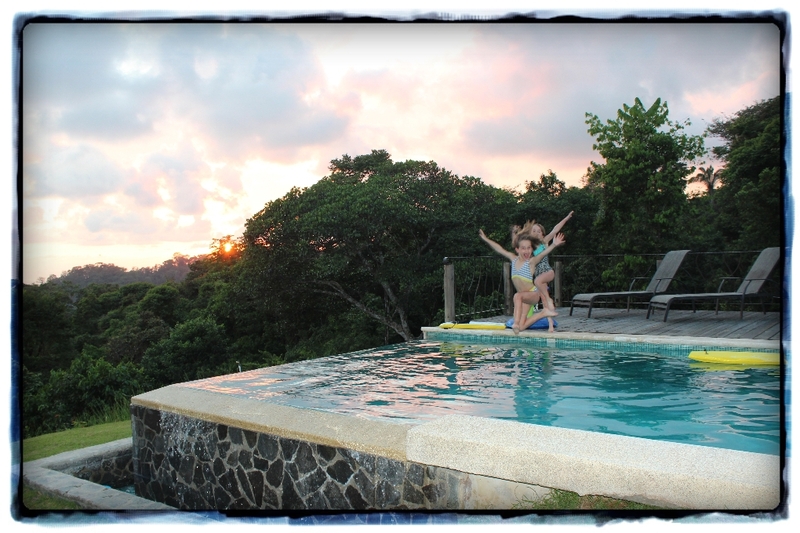 In my previous post I did promise to write about every day of our Costa Rican adventure but in all honesty I was too whacked at the end of each fun filled day to attempt anything more than drinking a glass of wine and documenting the range of visitors that turned up in the grounds of the house after dark. 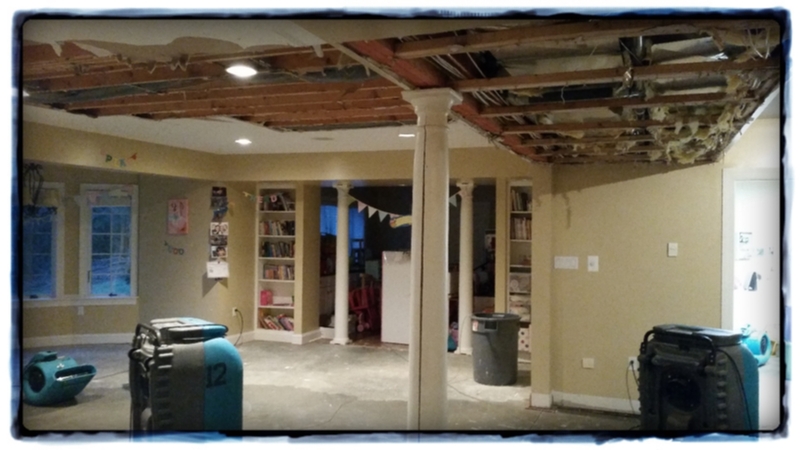 I told myself I would write when we got home but, as many of you know, we arrived home to discover some pretty serious water damage…as a result my focus was somewhat diverted! So this is my cheat’s version. I’ve been through the hundreds – I kid you not – of photos that we took, and picked what I think are the best. I won’t hit you with all fifty odd of them at once. Some today, some tomorrow and maybe some the next day. Hopefully they capture what was a wonderful holiday. 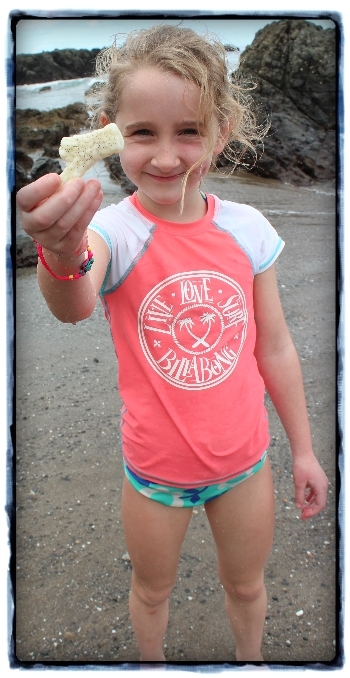 Our next adventure after surfing was a snorkeling trip. 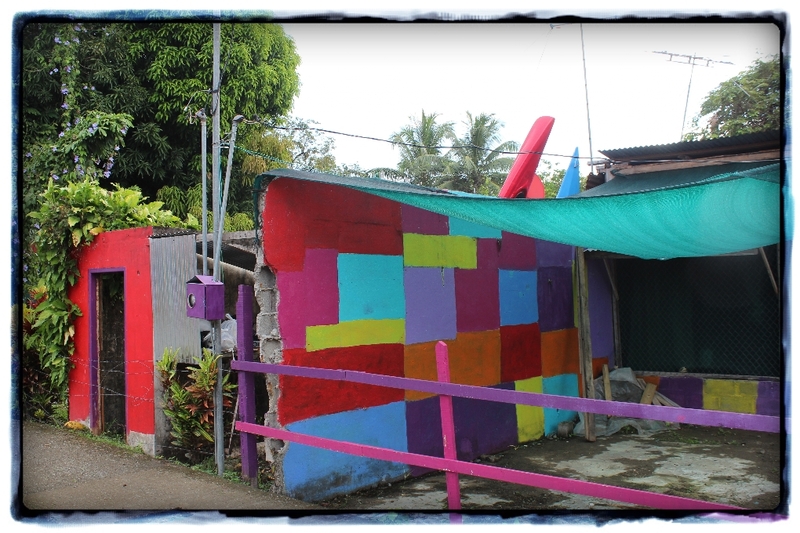 We met the boat crew at the Ballena National Park, where the entrance was surrounded by lots of colorful buildings. 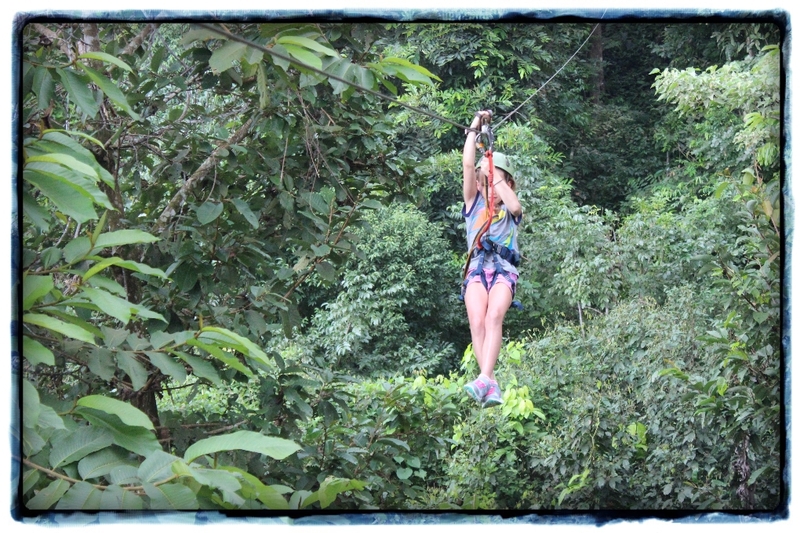 It was beautiful – lush greens and palm trees galore. 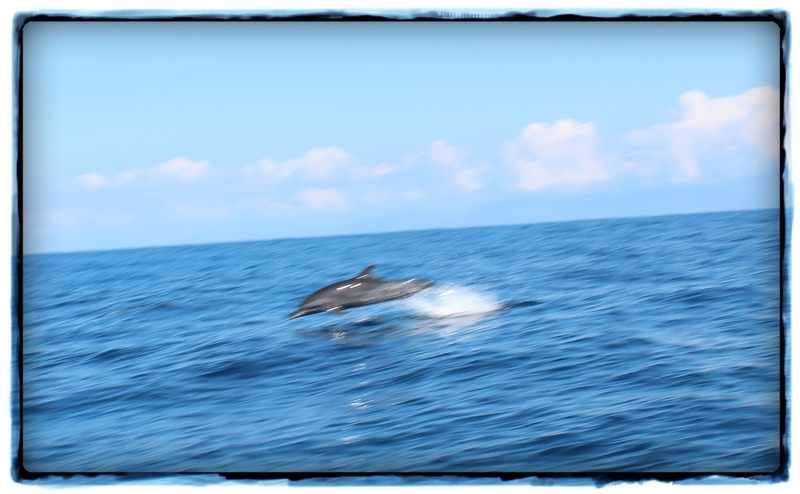 Highlight of the whole day – seeing dolphins galore. Amazing! 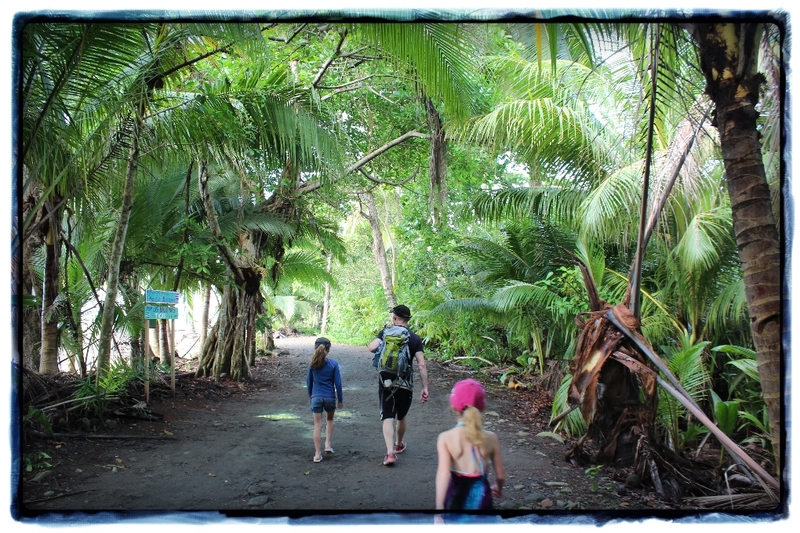 En route to Cano Island National Park. 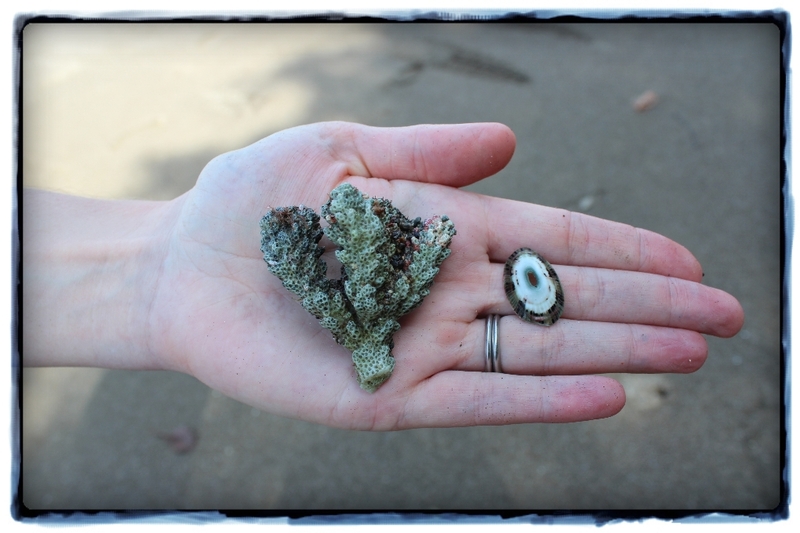 The girls had lots of fun finding interestingly shaped coral on the island. 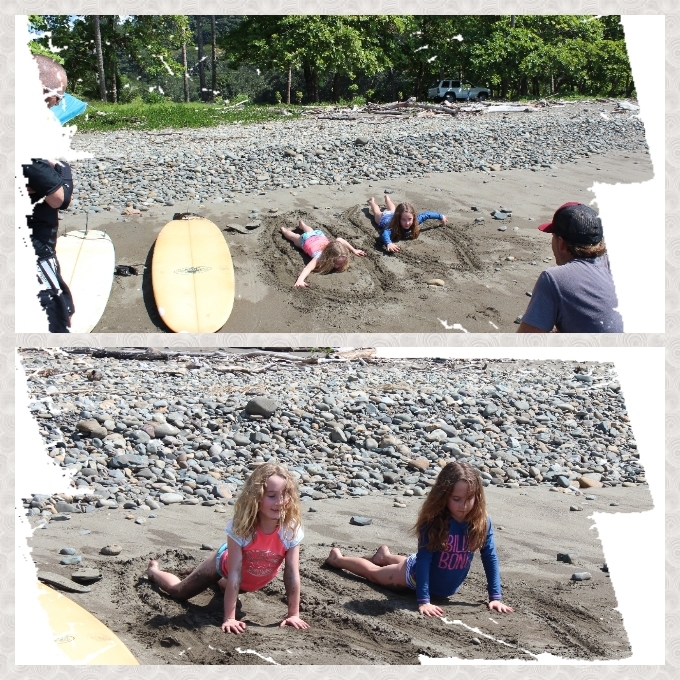 And doing their best to promote Billabong! 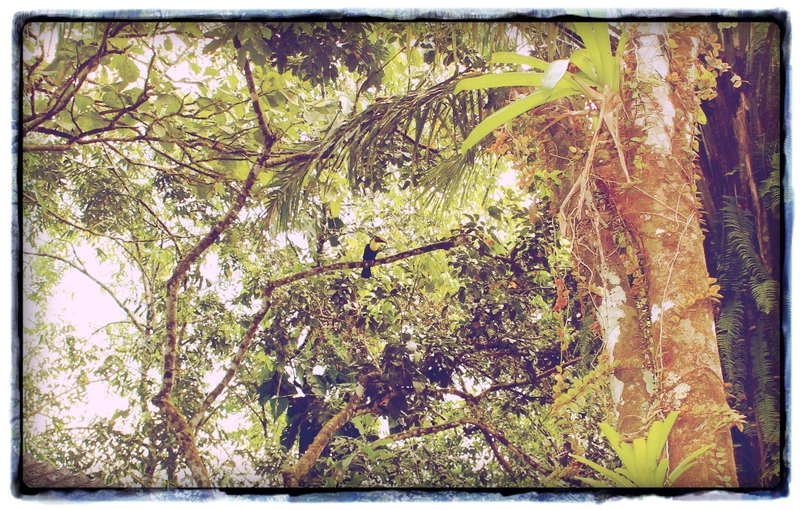 As Cano Island is a National Park we weren’t allowed to take anything with us. If we could have, these two would have been in my pocket. 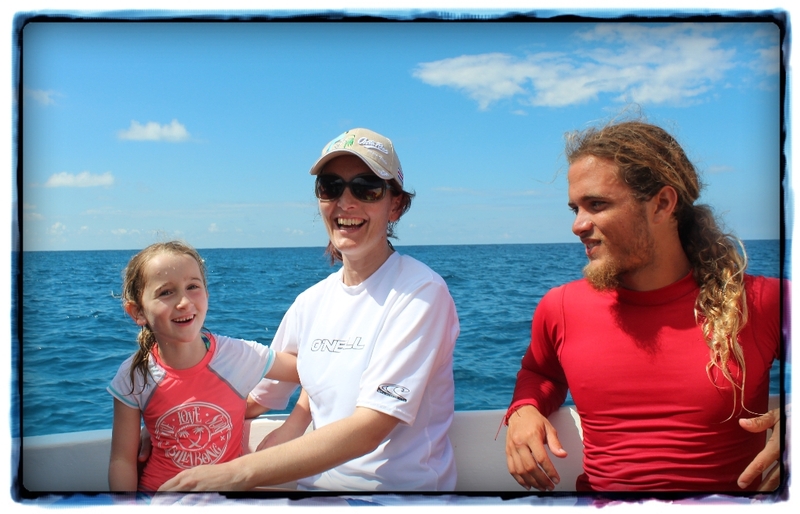 With Eric, our very cool snorkeling guide. 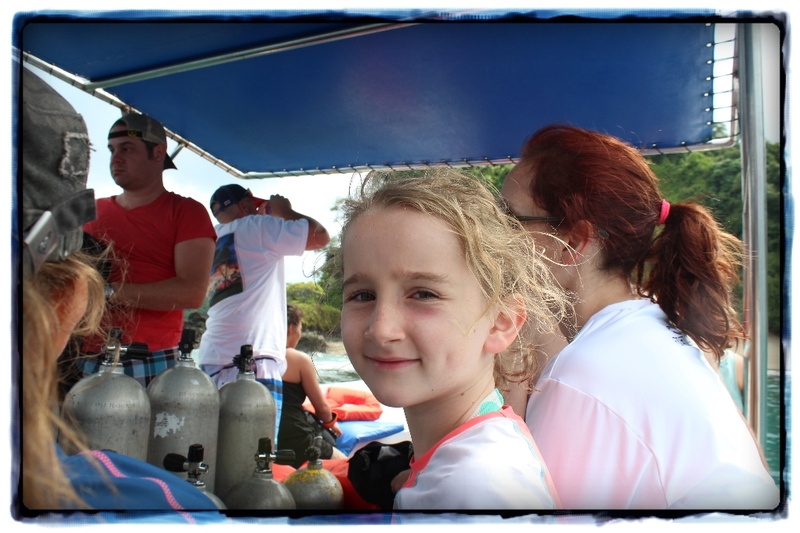 I didn’t get any photos whilst we snorkeled – Edie absolutely loved it, Olive not so much. I made the mistake of screaming out “shark!” excitedly, as a small one swam below us…and that was it…couldn’t get her back in the water. I was very impressed with both of them though. We weren’t snorkeling in the shallows near the island – they had to jump off the boat into deep water, not something I would have done at their age. I am somewhat ashamed to admit that it has been over six months since I posted. That has the dubious honour of being a record for me since I started blogging over four years ago. I’ve been away from this space for many reasons – which I won’t go into here!! 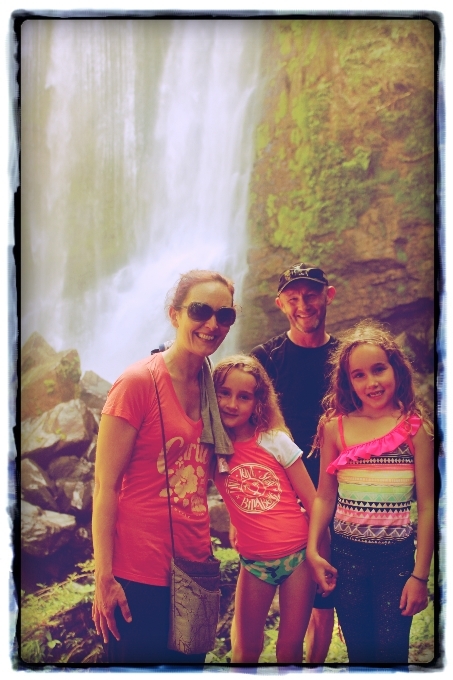 Suffice to say that as our Costa Rican adventure drew near, I knew it was now or never. If a dream holiday in a stunning destination couldn’t spur me into action then I think all would have been lost for onthecroadagain. The messages I also received, politely asking just what in the hell had happened to the Croad family, were also a much needed kick in the pants. 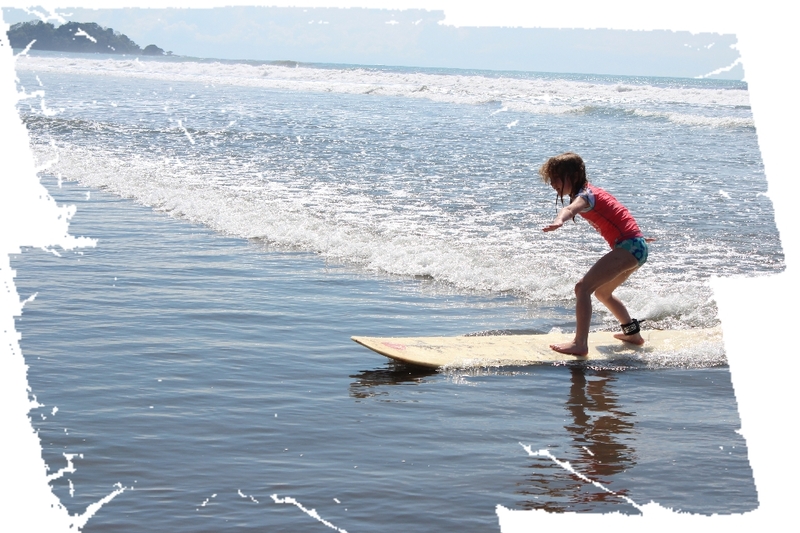 So here we are – surfin’ Costa Rica! 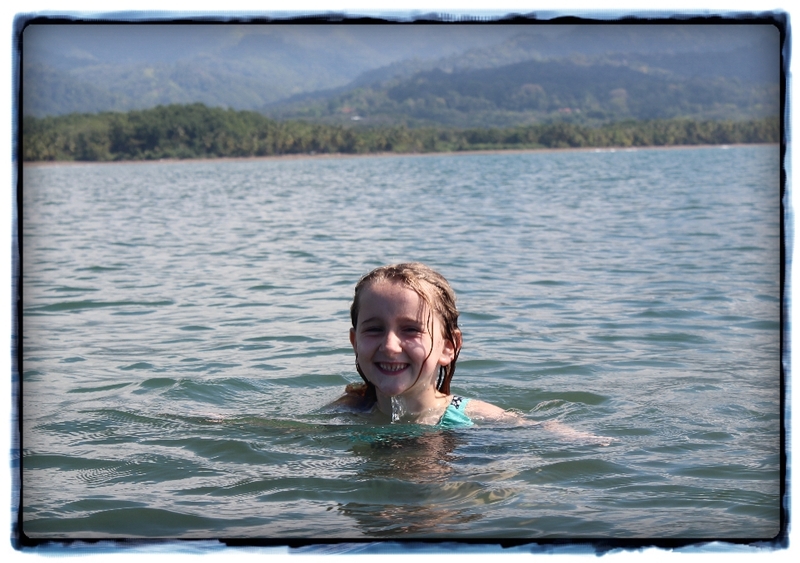 We are here in Costa Rica for Christmas largely because of a set of teeth – Richard’s to be precise. He was in great need of some pretty major dental work but the quote given to him by a dental group in Winchester was…to put it politely…somewhat on the high side. Richard was not impressed when the dentist quipped, “hey, it’s only a new car right?”. 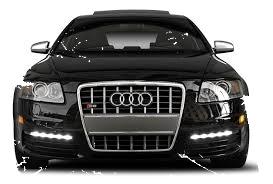 And this is the kind of new car the dentist was referring to…new set of teeth or Audi…new set of teeth or Audi…Audi??!! Being the resourceful chap he is, Richard was soon furiously researching other options and lo and behold, it transpires that Costa Rica is a great place to go if one is in the mood for a spot of dental tourism. I have to admit to experiencing some trepidation at the thought of a) Richard heading off to a tiny central American nation to have his mouth transformed and b) a significant change in the way he looked. My only experience of anyone having major dental changes was when my Dad (and I’m sure he won’t mind me mentioning this – right JBG??) had a new top plate thingy put in and it took everyone months to get used to the dazzling white teeth that emerged every time he opened his mouth. 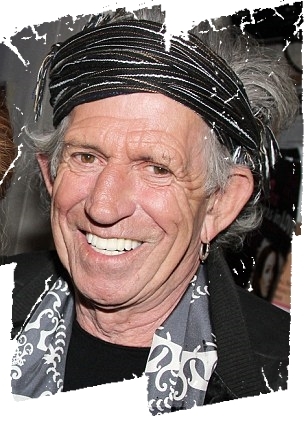 Ok…I’ll admit…this is not JBG…but the pearly whites are pretty spot on! 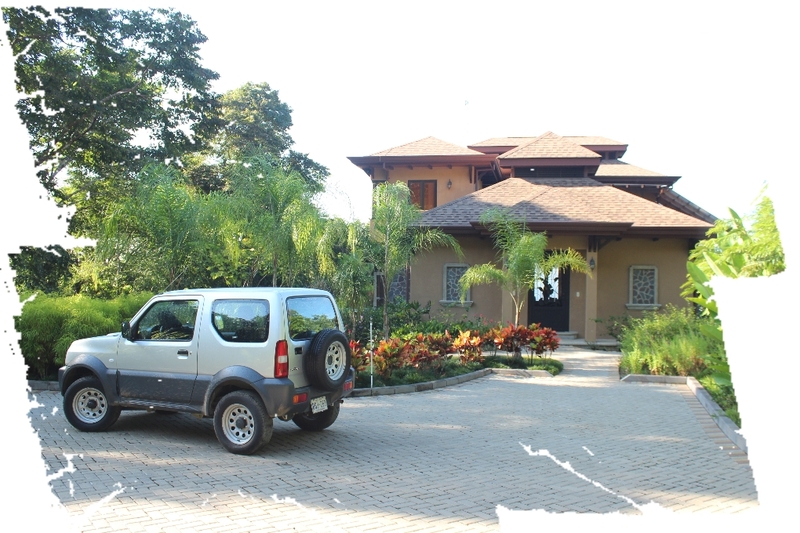 When the Costa Rican quote came in at a significantly cheaper rate – second hand Ford focus anyone? – the deal was sealed. In late June, Richard made his first trip down here, and it was anything but a tropical vacation with a bit of time in the dentist’s office on the side. The phone calls home were miserable, chronicling nine hour stints in the dentist’s chair, needles, crowns, implants….ugh. But by the end of the week, Richard had endured all the prep work and had made a firm friend in Guillermo – a taxi driver who helped endear him to the seemingly haphazard Tico lifestyle in the mixed bag metropolis that is San Jose. 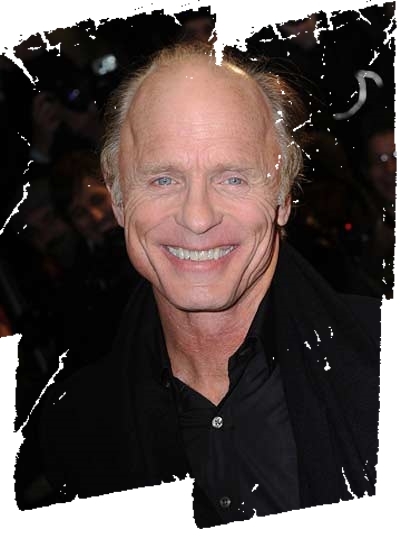 Ok…not Richard…Ed Harris and his smashing smile. On our first trip to Paris ten years ago, an American couple approached Richard and asked him “are you that famous actor?”. We stupidly never asked which actor they were referring too, but we are pretty sure it was Ed. bet they have good looking teeth. 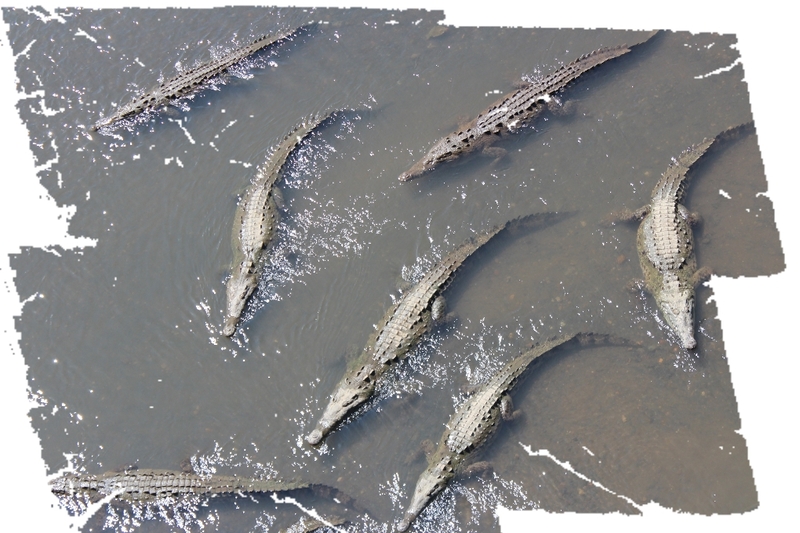 yes, it’s a river full of crocodiles! 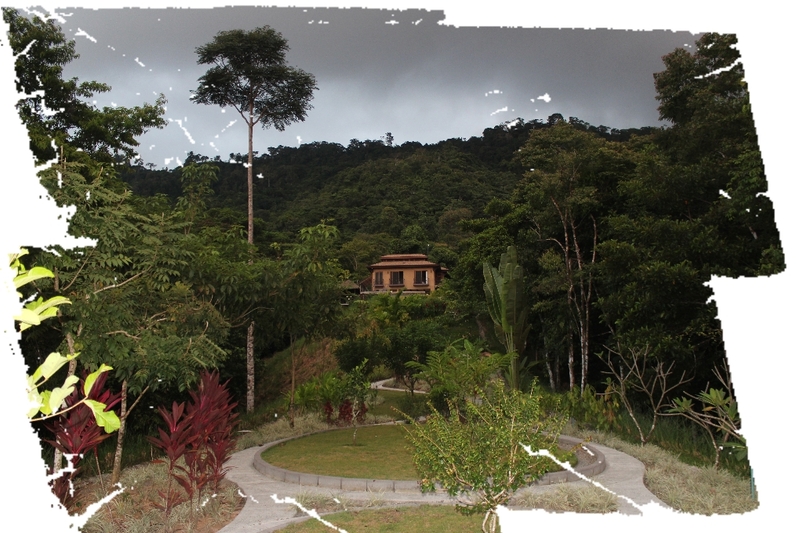 Welcome to Costa Rica! 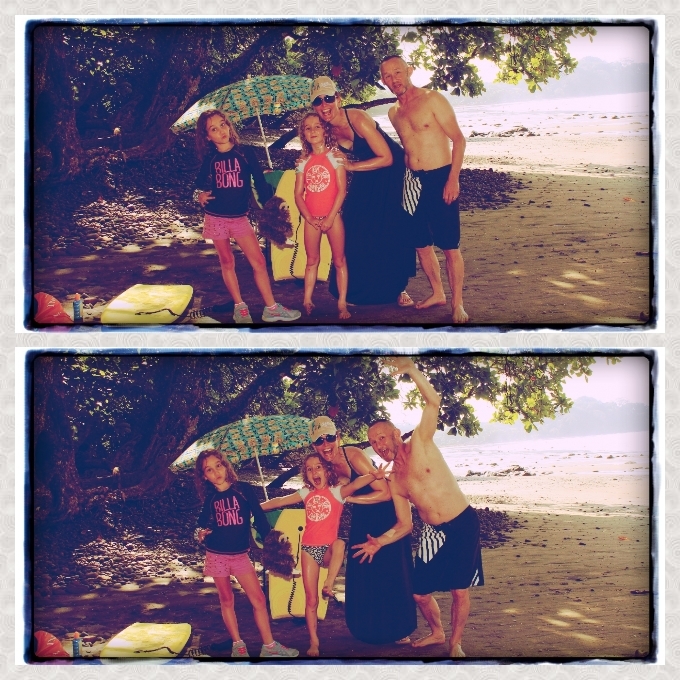 On our arrival in Dominical we met up with Neil, originally from London but an avid surfer, hence his relocation to Costa Rica. 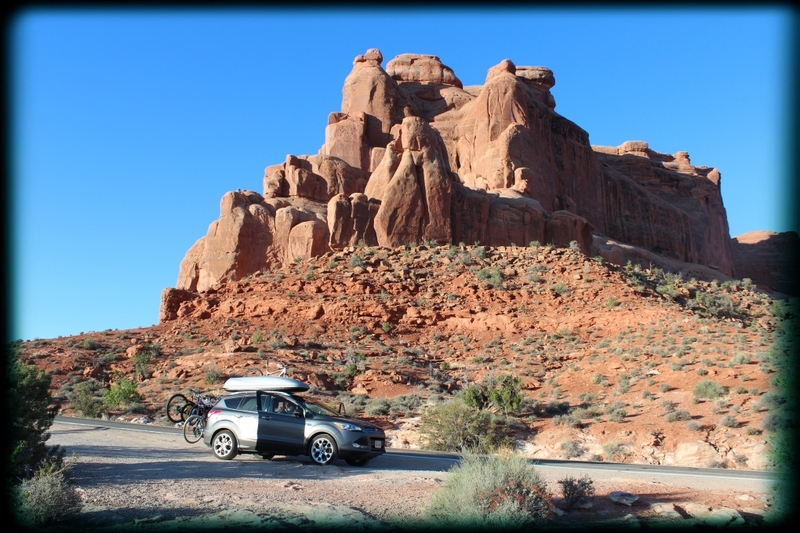 We followed his car to the start of a very rough and steep looking dirt track, at which Neil let out a cry of “yee hah!” and we began our ascent to Gorde Vista, our home for the next week. I think we are in for a pretty great week! 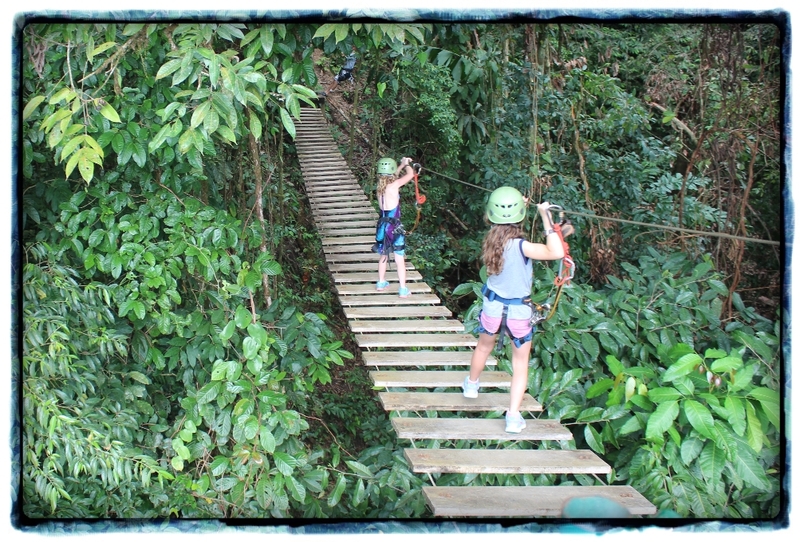 Mmmm…suspect we will have difficulty getting the girls out of the house to explore Costa Rica. Looking up at the house from the garden. Just beautiful. After much admiring of the house and garden, swimming, unpacking, swimming, grabbing a few groceries, swimming, popping out for a quick bite at a local seafood restaurant and more…you guessed it…swimming…it was time to hit the hay. 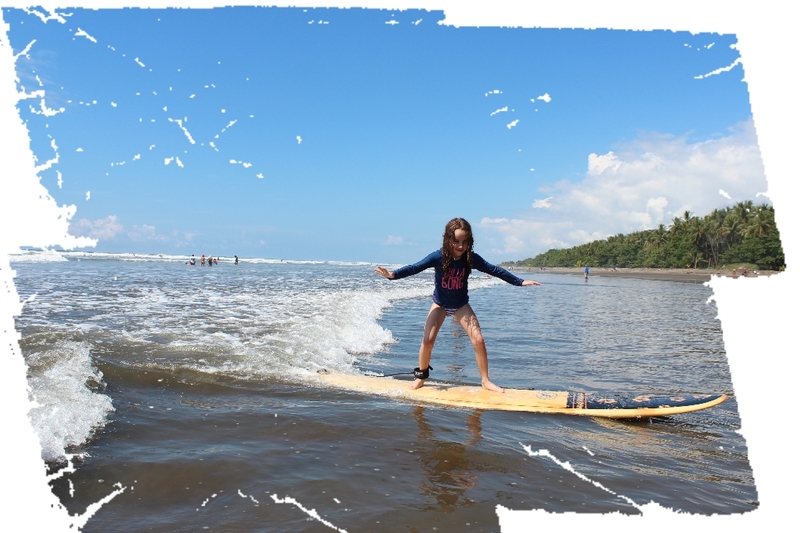 We had to be up bright and early for the first of our adventures – surfing lessons for the girls at Dominical beach. 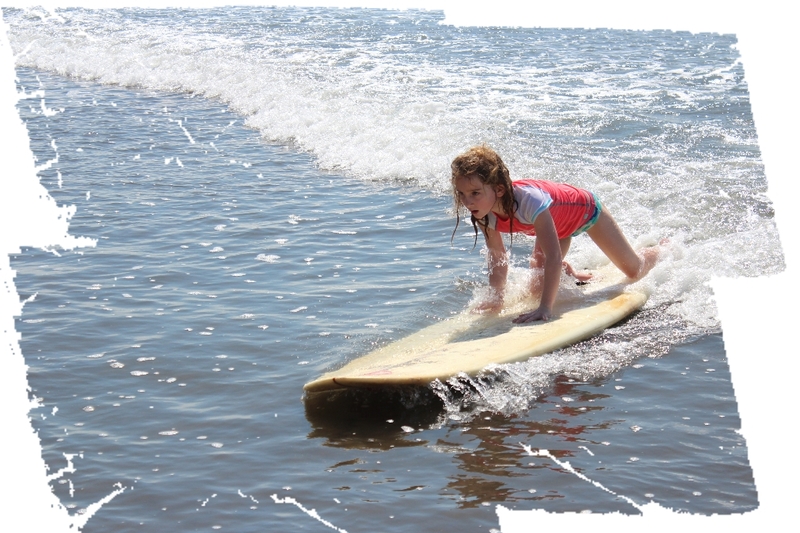 then pop up and adopt cool surfer stance…after that it’s time to grab your board and head into the ocean. Edie surprised us all by instantly getting the hang of it. My favourite picture of the day – love that concentration and determination. 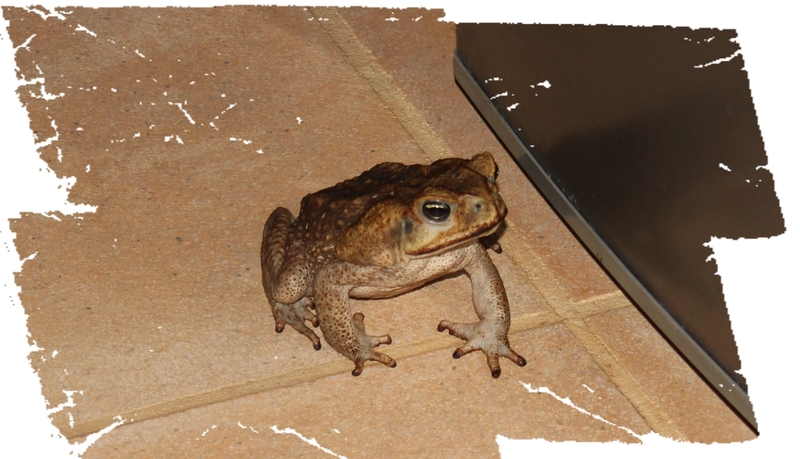 I feel the need for a David Attenborough voice over as we encounter all this wild life! Perhaps it will transform into Ed Harris if I kiss it!! Right – my word count tells me I have written over one thousand words which means this is in danger of resembling a university essay. We have had another action packed and animal filled day today…about which I will attempt to write after tomorrow’s action packed day. I suspect I will need another vacation to recover from this one! Unfortunately this was the best image of stoolball I could find – apologies for the lack of buxom milkmaids. 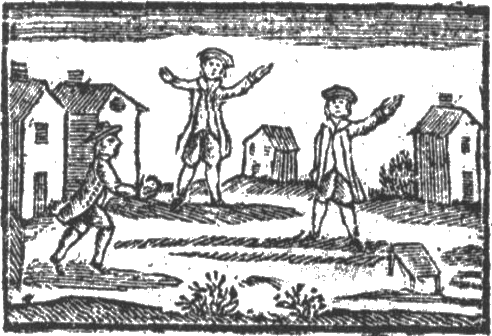 The early form of baseball was brought to North America by English immigrants, where it is first officially referred to in a 1791 bylaw from a town in Massachusetts – the game was not allowed to be played near the town’s new meeting house. By the early 1830s, games of baseball were popping up all over North America, but it wasn’t until 1846 that the first officially recorded baseball game was played in the United States. On June 19th in Hoboken, New Jersey, the New York Nine defeated the New York Knickerbockers 23 runs to 1. 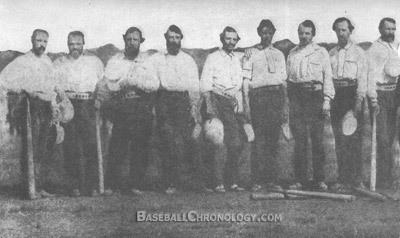 The Knickerbockers were responsible for putting some structure around the game – establishing rules around the number of innings, types of pitches allowed and type of ball that could be used. In the mid 1850s, New York went baseball crazy and the game started to be referred to as the “national pastime” or “national game”. Leagues and associations were formed and admission was charged at the big games. 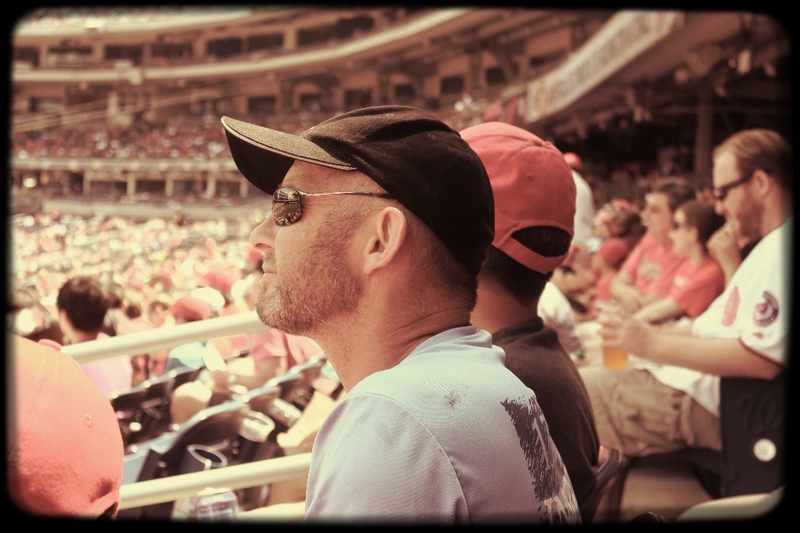 Today, I’m told, it’s NFL or American Football which holds the title of national sport or game, but baseball is still very popular, based on the crowds we witnessed at Nationals Park last Sunday. 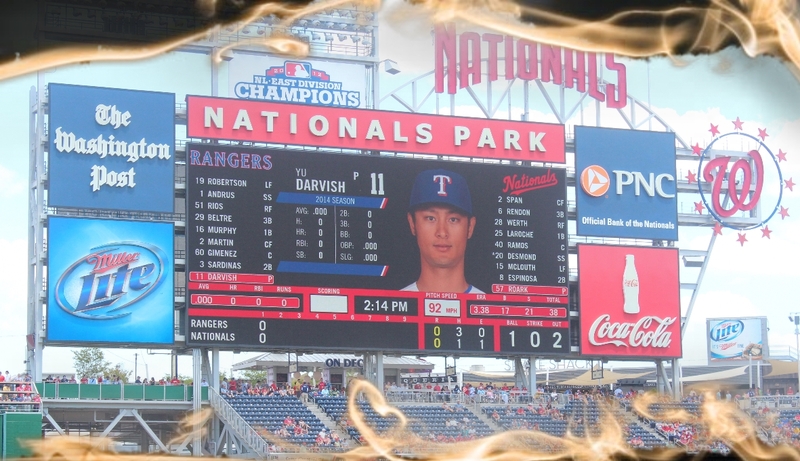 Our neighbours invited us to watch the Washington Nationals play the Texas Rangers. This was a pretty big deal as our neighbour is from Texas and it’s not often that the Nationals meet the Rangers on the field. This is due to one of the many confusing aspects of baseball. In the US there are two leagues – the National League and the American League and each of these leagues is split into East, West and Central divisions. 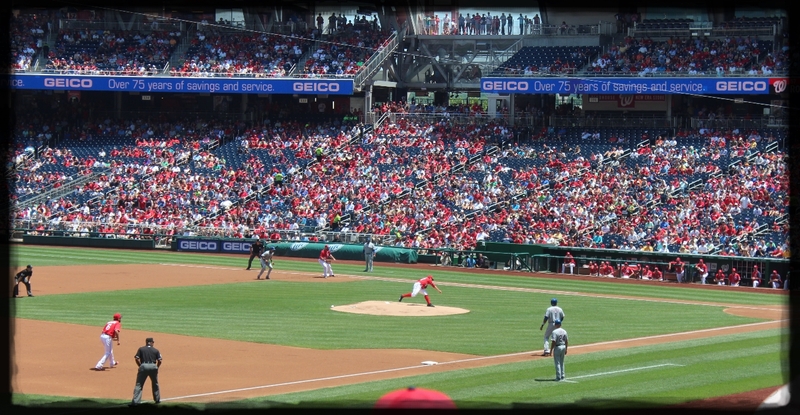 Because the Nationals are in the National League and the Rangers are in the American League, it’s rare that they face off against each other, so it was a particularly good game to see. Plus they didn’t just play one game – they played Friday, Saturday and Sunday. Another confusing aspect is just how many games there are…I won’t go into that because I’ve probably lost many of you!! I’ll just get back to the game we watched! 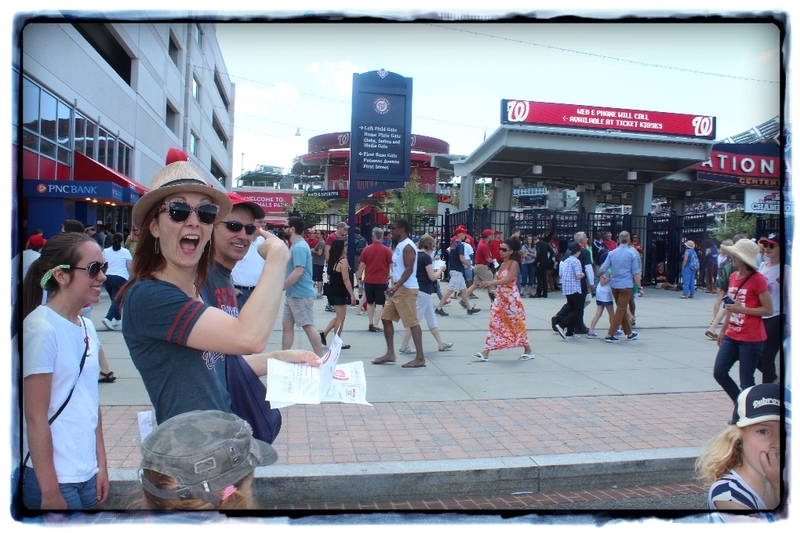 Nationals Park…home of the Washington Nationals…who up until five years ago used to be the Montreal Expos and were based in Canada…yet more confusing things!! We made sure we donned appropriate Nationals attire. 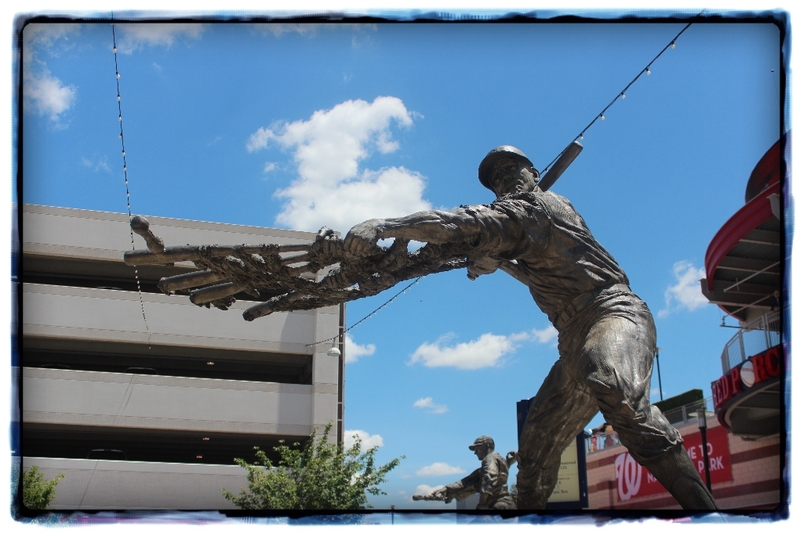 Baseball sculpture thing inside the stadium. First pitch of the game. The Ranger’s secret weapon is their Japanese pitcher. Baseball is one of the most popular sports in Japan – the first team was established in 1878. 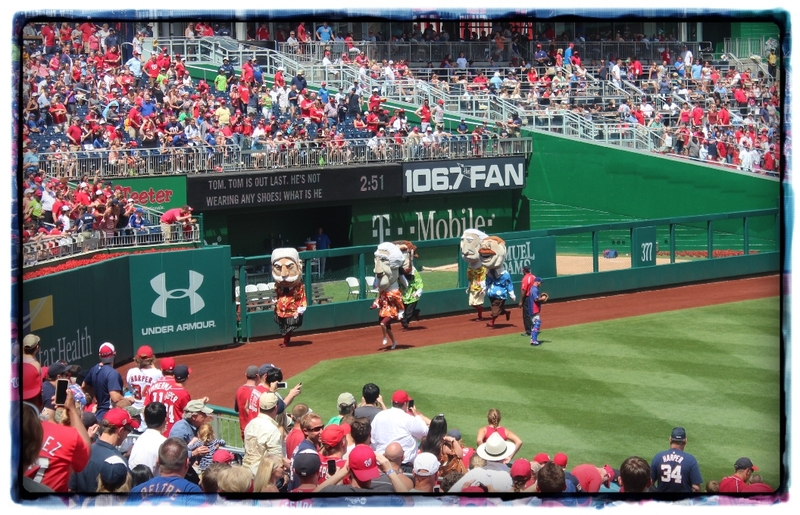 Keeping the crowd entertained is an important part of a baseball game. This is called the President’s race! 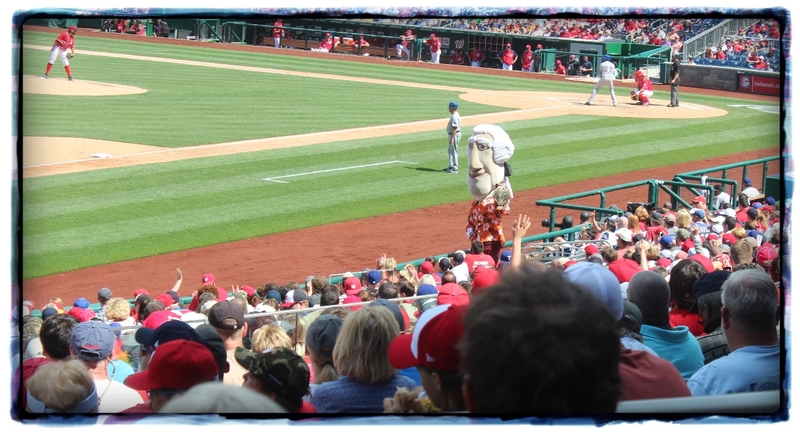 Thomas Jefferson was the winner and he strolled around showing off his winner’s belt. 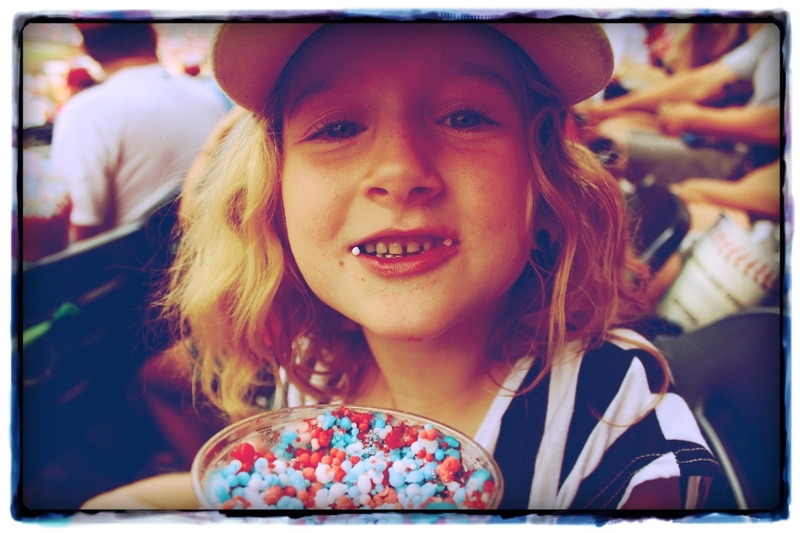 Edie indulging in some ice cream dippin’ dots. 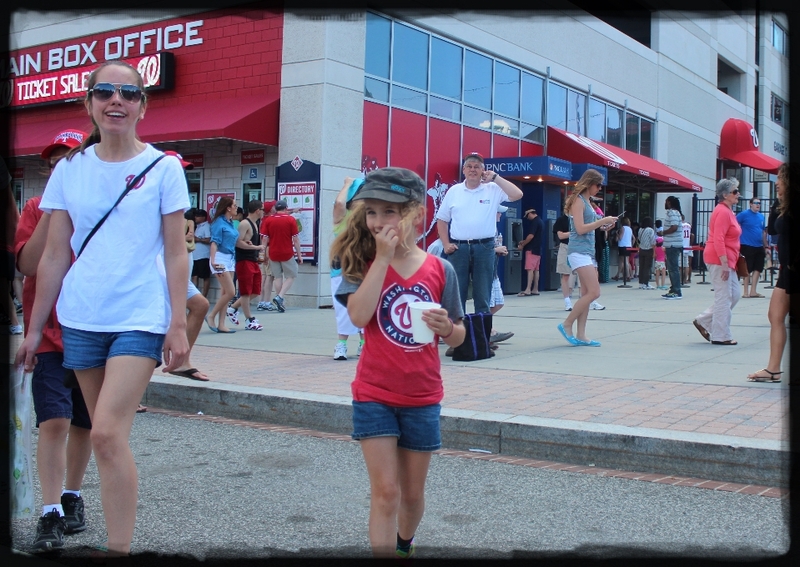 Other important baseball snacks are peanuts and Crackerjack – kind of like caramel popcorn. 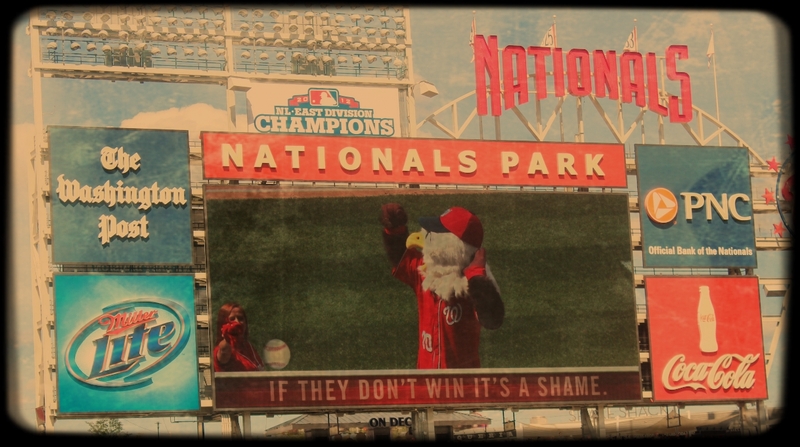 The Nationals mascot wasn’t too happy. After nearly three hours, the Rangers were victorious – two home runs to nil. So all in all it was a very fun afternoon. I don’t think we’ll be rushing out to buy season tickets but I’m sure if the opportunity presents itself we’ll be happy to venture out again to the old ballgame!